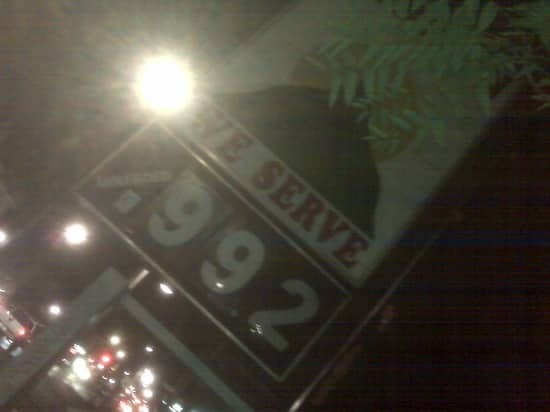 It's always interesting to keep track of fuel prices in other places. The current price for gas runs at about $1.07 in the St. John's area. This picture was snapped Wednesday in Toronto. 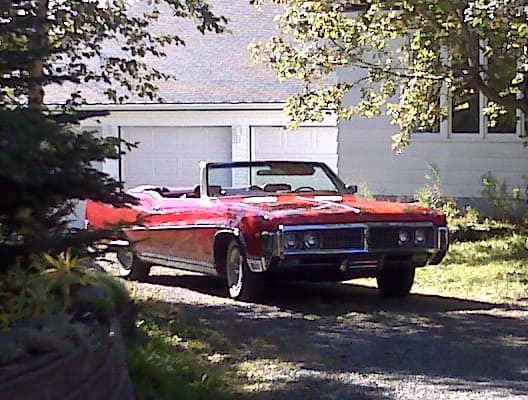 A '69 convertible is quite the beauty to spot on a weekend afternoon during a walk around Topsail Pond area. 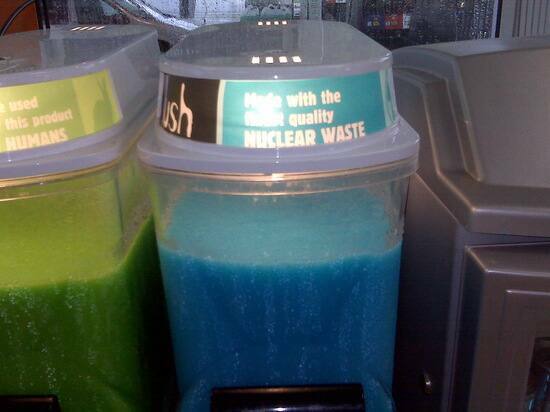 seen knows slushies aren't good for your teeth, but holy smokes, who knew it was made of this ingredient! 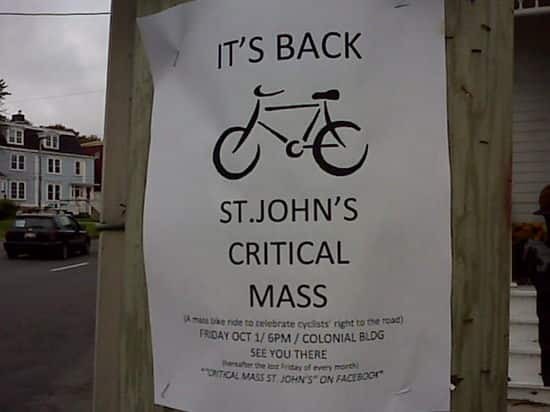 This poster give information on an event promoting bike riding in St. John's on Friday. seen wants to return briefly to the time before Igor. 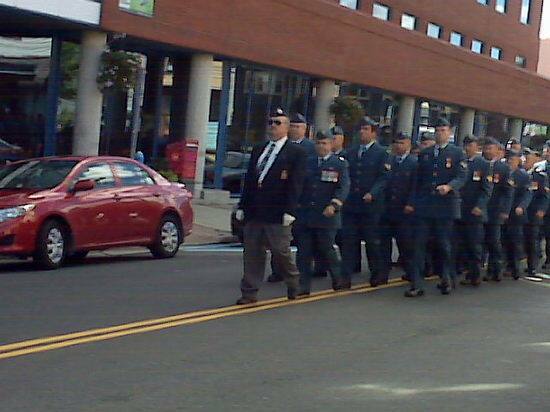 Here are images of a military parade in downtown St. John's on Saturday the 18th. 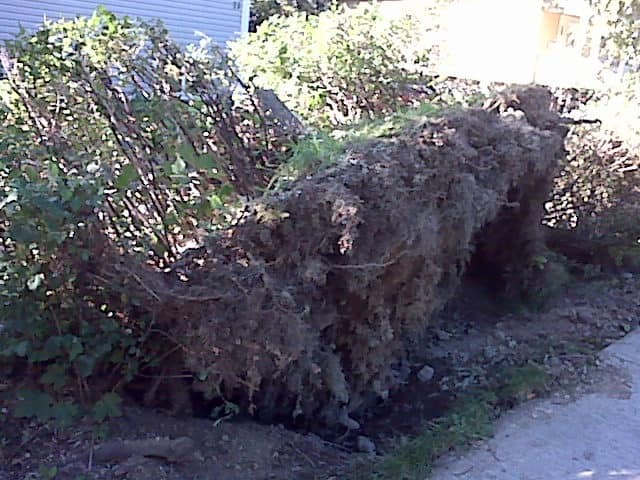 Hurricane Igor hit a week ago and the cleanup still continues. 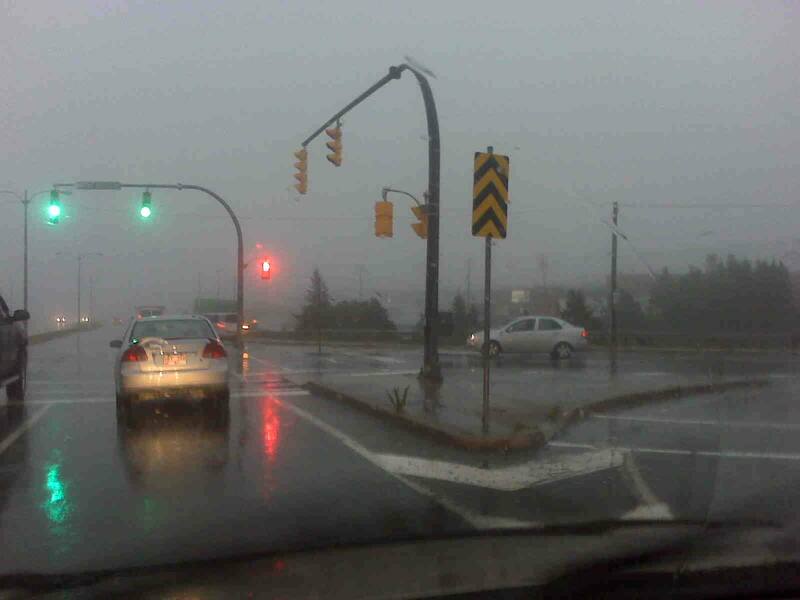 Here are images that were taken in St. John's this morning. ·Long Pond Bridge - Currently open to pedestrian traffic. Bailey bridge to be completed by this afternoon (Monday, September 27) providing connection for one-lane traffic with traffic lights in place. ·St. 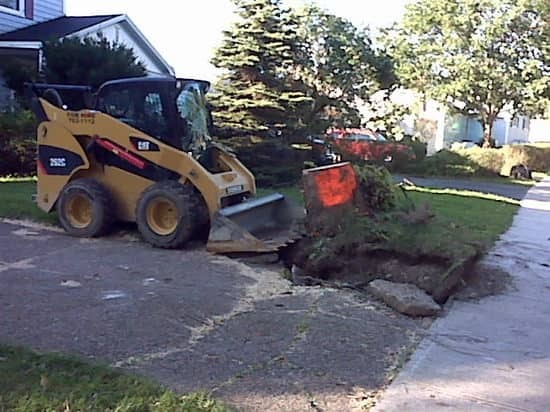 Lawrence to Lawn should be connected via a temporary connection by mid-week. ·Route 215, Petite Forte Road is expected to be open to one lane of LIGHT TRAFFIC ONLY by this evening (Monday, September 27). ·Route 230, connection to the Town of Bonavista re-established with LIGHT TRAFFIC ONLY through Port Rexton. 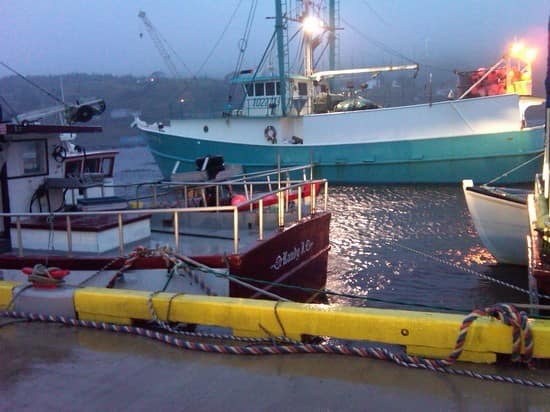 Work is ongoing to restore unrestricted access through Port Rexton to Bonavista and is expected to be completed by Thursday evening (September 30). Work is ongoing to restore traffic flow on Route 230 to two lanes. ·Route 235, to Summerville from the south and to Newman's Cove from the north is connected. It is expected to take 7-10 days before all connections on this route made. ·Route 236, Stock Cove Road is now open. 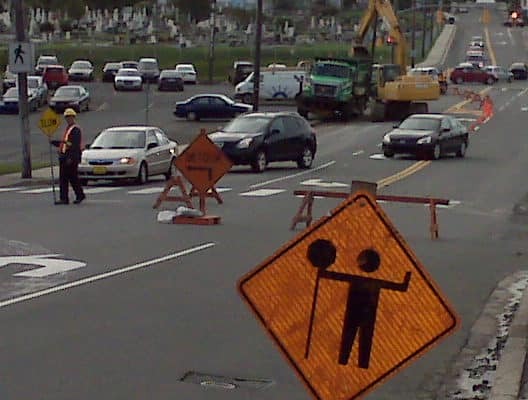 ·Work has started on Route 237, from Catalina to Amherst Cove. ·Route 232 to Monroe is connected. The remainder of Route 232 through to Burgoynes Cove will likely take several more days to a week. 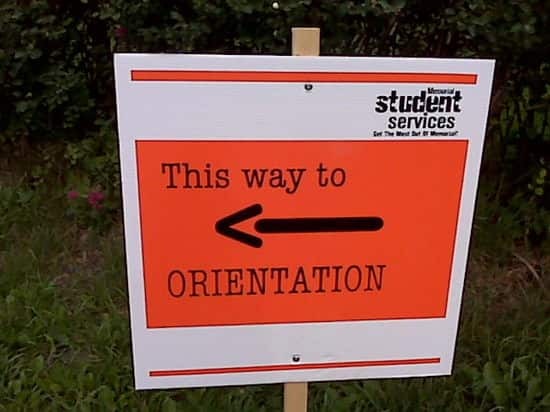 The department expects to connect to Waterville today (Monday, September 27). 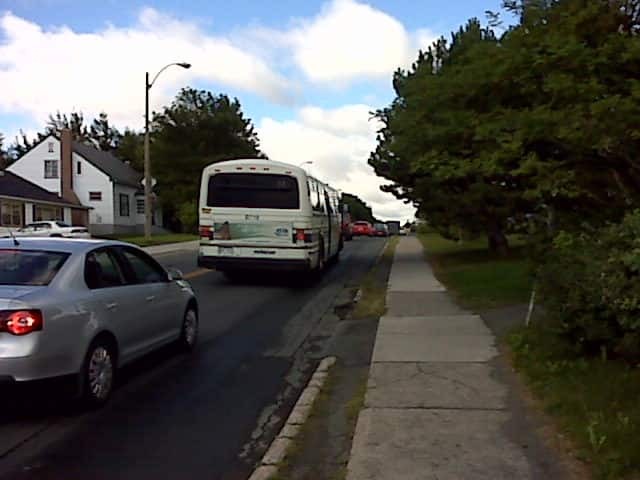 ·Route 239 to Trinity expected to be connected by tomorrow evening (Tuesday, September 28). Once Trinity is connected, work can commence on restoring access to the remainder of the communities on this route. ·Route 204, through to Southport connected. Emergency operations centre: 1-888-395-5611 For individuals requiring urgent assistance with shelter, food, supplies and other needs, and to report broader concerns with infrastructure. The Eastern School District says all schools will be open in the Avalon East and Avalon West regions on Monday, September 27, 2010. The following five schools will be OPEN on Monday in the VISTA region: Clarenville Primary, Clarenville Middle School, Clarenville High School, Balbo Elementary and Tricentia Academy. The following ten schools will be OPEN on Monday in the BURIN region: Christ the King School, Donald C. Jamieson, Pearce Junior High, John Burke Academy, Lake Academy, Marystown Central High, Sacred Heart Academy, St. Lawrence Academy, Holy Name of Mary Academy and St. Anne's School. Pedestrian traffic is being permitted at Rattle Brook - people are being escorted across. Long Pond Bridge has been closed temporarily to allow for further maintenance work. It is expected to last approximately two hours. Eastern Health has set up a special centre to help people who've been isolated by Hurricane Igor and need urgent medical care or supplies. 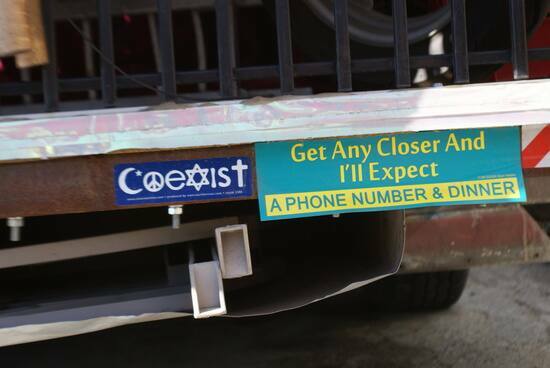 The toll-free number is 1-888-382-4474. The email address is logistics.igor@easternhealth.ca. Urgent announcement for people on Fogo Island...power will be out throughout the island from 12:30 to 4:30 today to conduct emergency repairs on the Fogo Island substation. the highway from Grand Bank to Lawn is open. the highway from Goobies to Bay L'Argent is open. Please use caution when driving any of these routes as there are still narrow places and minor washouts. The only break on the Burin Peninsula Highway is at Rattle Brook, where work is ongoing to install a bailey bridge (alternate route). 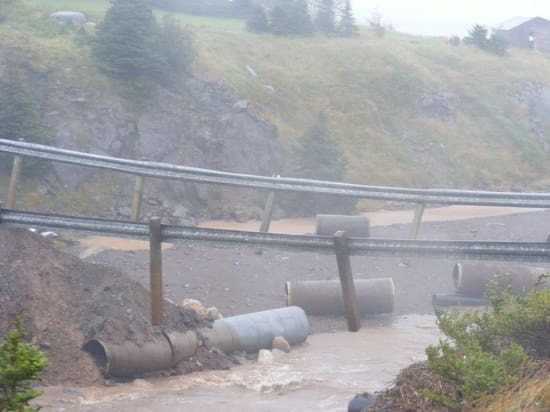 The estimated time that the Burin Peninsula Highway will reopen is still Sunday, although it could be a little earlier. I will provide an update as I get it. An update on the national historic sites: Cape Spear Lighthouse will remain closed until further notice; the Ryan Premises, Signal Hill and Castle Hill are opened to the public. The Red Cross is looking for financial donations. Over the past few days, the Red Cross has operated comfort centres and shelters in Clarenville and Freshwater and brought water and food to Placentia, Hare Bay and Beau Bois. Anyone who wants to make a donation to Red Cross can call 1-800-418-1111. 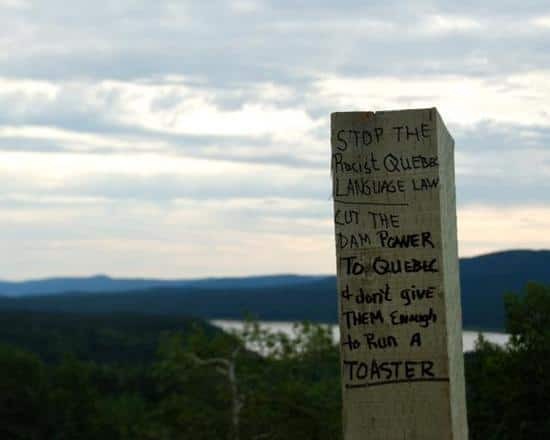 Newfoundland and Labrador Hydro has a warning for people the area of the Granite Canal By-pass Structure, located in central-south Newfoundland. The company will be spilling water at the Granite Canal structure starting today due to heavy rainfall in the area and subsequent run-off. This will result in sudden changes in water levels over the coming days. The public is advised to use great caution when in the vicinity of Granite Lake and Meelpaeg Lake. Service Canada Centre in Pleasantville is open. The Port Rexton reading series "just before dinner" has cancelled its event for this Saturday. will be held next Saturday. 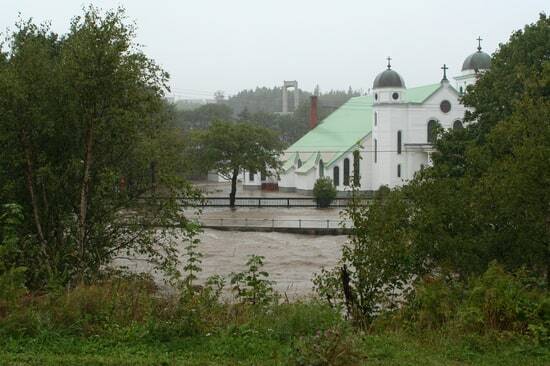 St. John's orienteeting club event scheduled for Sunday in Cape St. Francis has been cancelled. Health and Community Services offices at former Belvedere Orphanage building, 57 Margaret's Place (off Newtown Road) will be open during regular business hours today. The Basilica is still without power,but the 9:30 mass will be going ahead..The office will be closed for the day. CNIB will be open for business as usual this morning. The Petten Building (provincial fisheries dept.) is open today. Motor Vehicle Registration Building in Mount Pearl closed because of electrical damage from Igor. The toll-free number 1-877-636-6867 and online services still working. 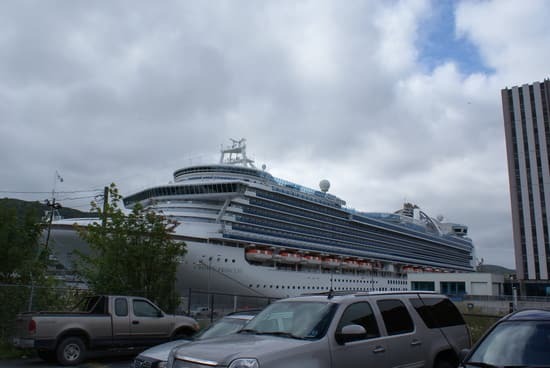 The craft and home trade show in Clarenville this weekend has been cancelled. College of the North Atlantic, Clarenville Campus will remain closed today (fri). The Salvation Army wishes to advise residents of St. John's and area who are still without power that hot meals will be provided at the Salvation Army New Hope Community Center, 18 Springdale Street, at Noon on Friday, September 24th. In that sit-down space is limited, take-out service will also be provided. 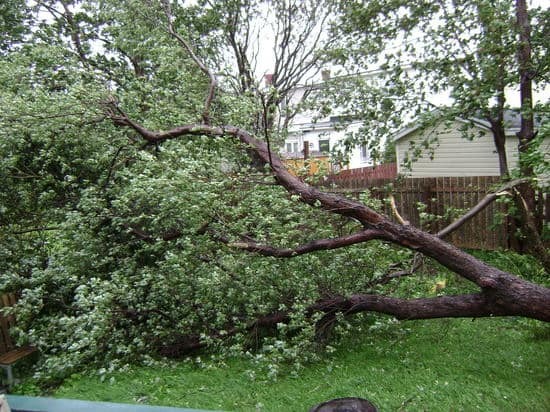 St. John's and Mount Pearl will be providing tree branch collection and drop-off services. details on their websites. 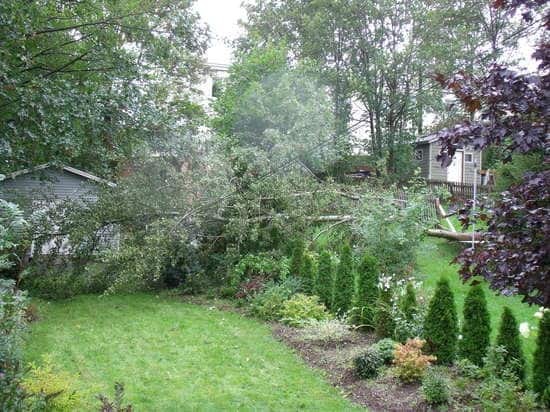 The Canada Revenue Agency says it will be providing tax relief to people affected by Hurricane Igor. Individuals and businesses who can't can't pay taxes because of the hurricane should contact CRA to apply for taxpayer relief. Eastern School District wishes to advise parents and guardians that ALL schools in the Burin and Vista Regions are CLOSED for the day. All schools in the AVALON EAST REGION are OPEN today. Parks Canada advises the travelling public that, the contractor repairing the damage to the Trans Canada Highway through Terra Nova National Park, is working on schedule and the road is anticipated to re-open today, September 23 at 4:00 p.m. At this time, Parks Canada is working hard to have two lanes open at 4:00 p.m. The TCH at Joey's Lookout near Gambo is closed until further notice. Emergency vehicles are allowed through. Glovertown telephones are down, so if anyone needs an ambulance, they can call the cell number at Delaney's Ambulance Service 424-2026. 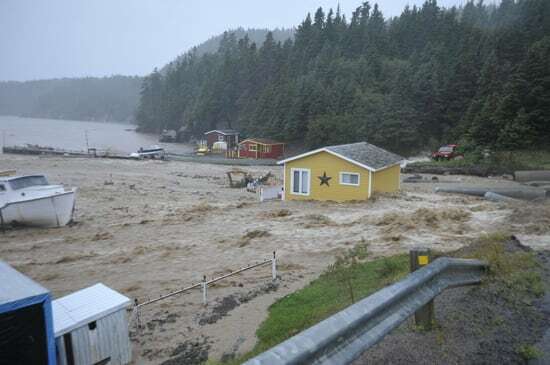 The mayor of Trinity (Trinity Bay) Jim Miller says their state of emergency continues. 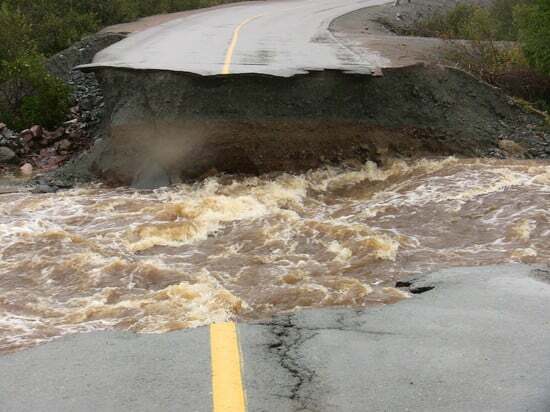 they have no road access to the Bonavista highway. 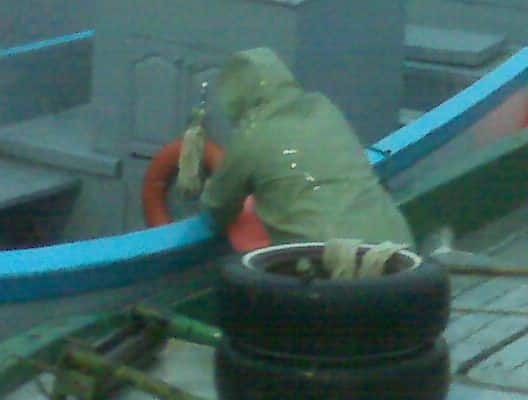 people are getting in and out by boat right now. They're still without power but hoping to get it back by the end of the day. They're also hoping to get road access by the end of the day. 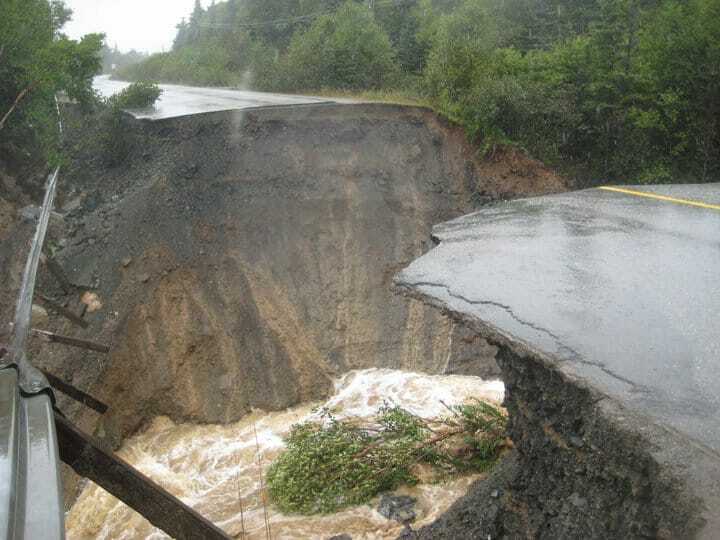 Road from Gander to Wesleyville. Parks Canada says the road should be repaired and safe to open to the travelling public today (Thur) around 4:00 p.m., if repairs run according to plan. Parenting Young Children Group offered by the Janeway Family Centre - was supposed to be at Mount Pearl Intermediate at 7 p.m. Cancelled. Will happen next Thursday, September 30, same place same time. Public Service Credit Union 403 Empire Ave - power now restored, open for business and normal operations. The Reid Community Centre is open for showers until 9:30 tonight. Opens again at 6 a.m.
Mount Pearl Lions Club and City of Mt Pearl free soup and sandwich from 5-7 at Park Place Community Centre... to assist homeowners without power. Eastern Health says operations at the Placentia health centre are back to normal; Laskey place in Clarenville is open, but call ahead to make an appointment at 466-5700; and phone lines at St. Pat's home in St. John's have been restored. ---A free curbside collection service is available by contacting the City's Service Centre at 311. 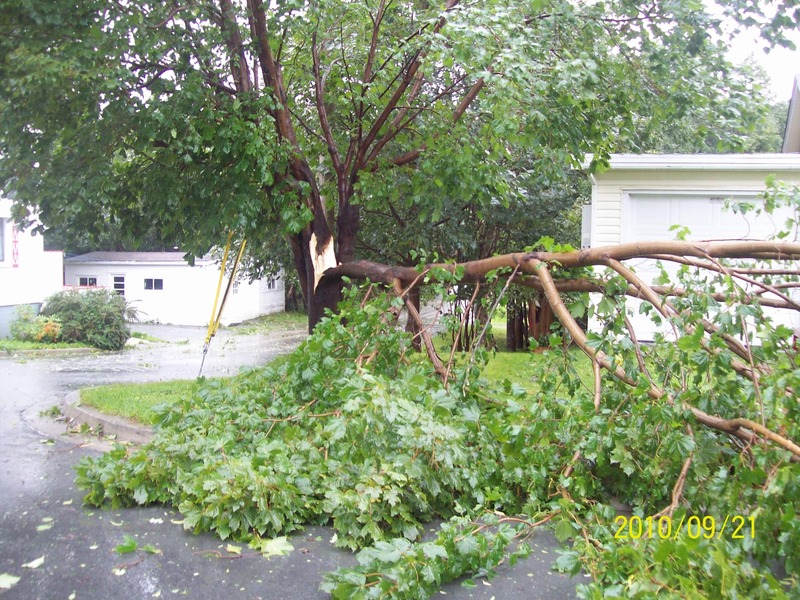 Trees and branches must be cut in manageable-sized pieces (maximum length 8 ft) and placed at the curb for collection. 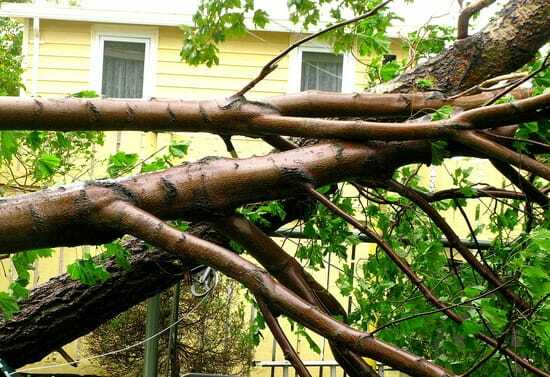 ---A free curbside collection service is available for household items damaged by Hurricane Igor. This service is by appointment only and does not include building materials (these should be disposed of by your contractor). Metals must be separated from other items for a separate collection so the metals can be recycled. Please contact us at 311 to book your appointment. 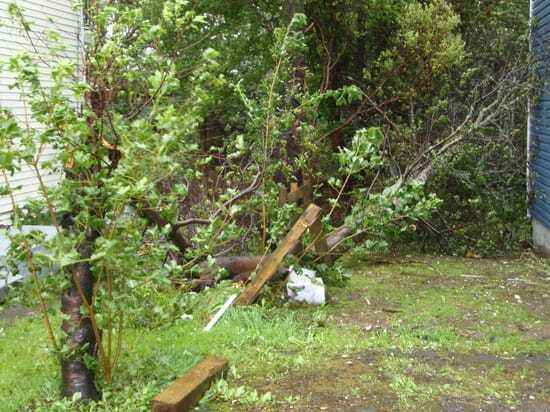 ---In addition to the special services offered above, residents may dispose of trees, branches, household items and building materials at the Residential Drop-off facility at Robin Hood Bay free of charge. Hours of operation are Tuesday to Saturday, 8:00 am to 4:00 pm. VON Meals on Wheels Program, no meals will be going out to the West End location due to power issues. MUN Cinema is cancelled for this evening (the film AJAMI). Because of IGOR the film is sitting on the TCH somewhere near Gander and won't make it to the Empire theatre on time. Motor Vehicle Registration Building in Mount Pearl is closed for the rest of the day. But you can still use the toll free number (1-877-636-6867) or go online. The Petten Blding (provincial fisheries dept.) closed for rest of the day. The Autumn Equinox that was supposed to take place tonight at the Lantern on 35 Barnes Road has been postponed until Wednesday September 29th. Curriculum night at St. Peter's elementary cancelled for this evening, will be re-scheduled. Riverwood Academy, Wings Point, will reopen for the afternoon. Busses will begin picking up students at approximately 11:45. Classes will begin at 12:30. The Aquarena will be closed for the morning. Update @ noon. The Field House is open and Aquarena Fitness Centre members can use all services in the Field House. Please note that the Service Canada Centre St.John's (Pleasantville) will again delay its opening today, due to a power outage. A further update will be provided at 11AM. At Memorial University's St.John's campus HKR 1000 sec 002, with Ryan Symes, scheduled for 1 p.m., in room ED-4008. Offices of Dr. Derek Dunphy and Sean O'Leary (193 Elizabeth Avenue) will be closed for the day with an update tomorrow morning. Still no power at the Basilica of St. John's the Baptist, 9:30 mass is cancelled, church and the office closed all day. The Belvedere Building on Margaret's place remains closed today. Motor Vehicle Registration Building closed this morning. Update at noon. Use the toll free number (1-877-636-6867) or go online. 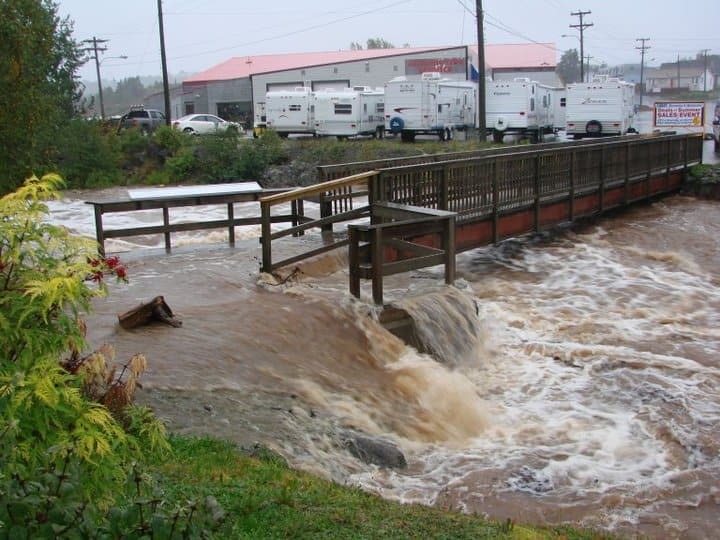 rennies river duck race is now oct. 2.
the arthritis in the worplace public forum for today is cancelled. Offices of the Community Sector Council (former Community Services Council) are closed until they get the power back. The council also doesn't have access to its phone and email services. Natural Resources Building on Elizabeth Avenue is open. Torbay Road Animal Hospital will be closed until noon due to power outage, will update @ 11. Newfoundland and Labrador Sports Centre still doesn't have power, no programs will be going ahead. Mount Pearl Public Library closed, with an update at noon..
Any students participating in the MUN LAB BAND and ORCHESTRA program are to come to the placement session @ 3:30 today in room 1034 @ the Music School. Children's Centre Preschool on Crairmillar Ave. reopening today. The Alumni Affairs and Development Building at Memorial University is closed this morning due to no power. There will be an update mid morning. Service Canada Centre St.John's (Pleasantville) will delay its opening today, due to a power outage. A further update will be provided at 9AM. Churchill Square medical clinic closed this morning, but open this afternoon. Association for New Canadians language school on Smithville Crescent closed for the day. Click on the title Storm Photos Sept. 23 to see the photos. 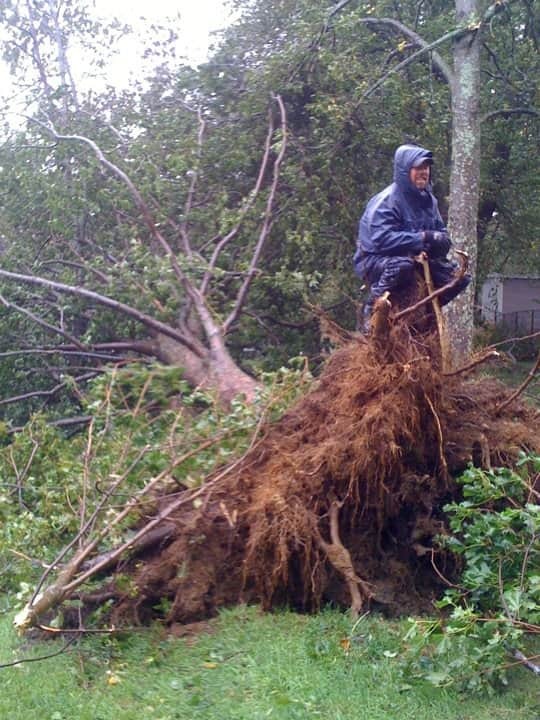 Continue reading Storm Photos Sept. 23. For Thursday, September 23rd, 2010. UPDATED: Avalon East Region: Vanier Elementary will open for the afternoon classes. Doors open at 12:10 p.m.; classes start at 12:35 p.m.
William Mercer Academy and Jane Collins Academy will remain closed this afternoon because there's no water. Riverwood Academy, Wings Point, will reopen for the afternoon. Buses will begin picking up students at approximately 11:45. Classes will begin at 12:30. The Eastern School District advises that schools in the Burin and Vista regions will remain closed on Thursday, September 23, 2010. Ecole Des Grands Vents is closed all day. St. Bonaventure's College WILL RE-OPEN today (Thur). It is DAY 6 on the schedule. Crescent Collegiate, Blaketown will be closed this morning due to damaged roads west of Whitbourne. There will be an update aT 10:30 for the afternoon classes. A decision regarding Curriculum night will be announced at 10:30 as well. Parks Canada advises the travelling public that, according to information received from the contractor repairing the damage to the Trans Canada Highway through Terra Nova National Park, the road should be repaired and safe to open to the travelling public tomorrow, Sept. 23 around 4:00 p.m., if repairs run according to plan. 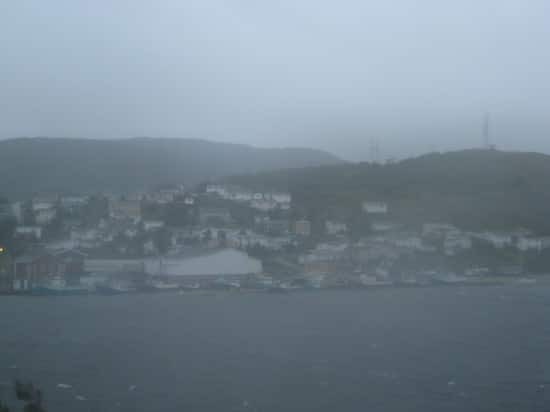 The Burin Peninsula remains isolated with at least 4 washouts prior to Marystown. The Bonavista Peninsula is totally isolated due to numerous road outages. 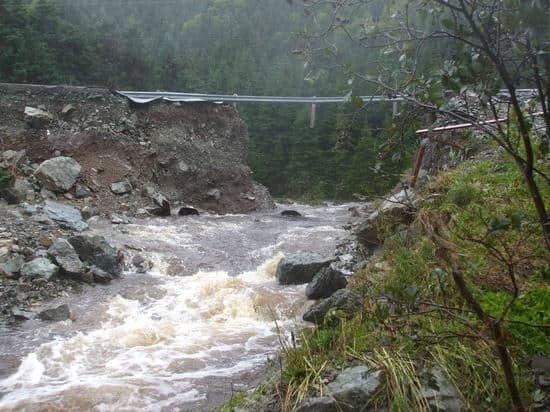 The TCH at Thorburn Lake and in Cobblers Brook remains closed and will be for at least today. The gap in the road at Cobblers brook is 20 meters across and 20 meters deep. Engineers are assessing this afternoon. State of Emergency LIFTED in Gambo. However, still major flooding. 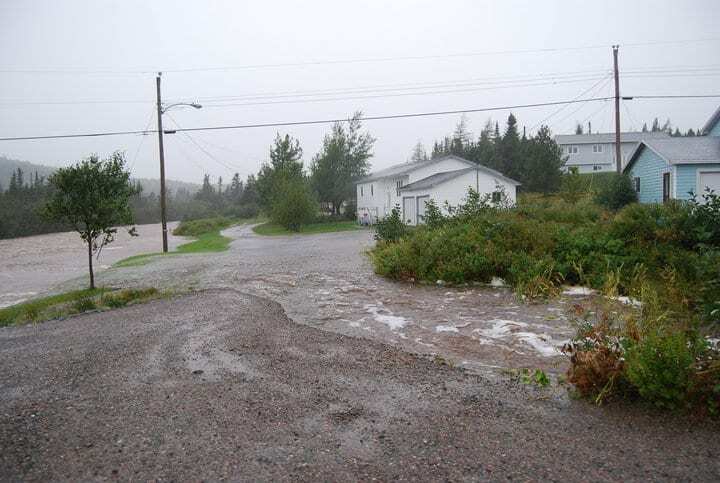 Gambo pond has overflowed its banks, and Gambo South has flooding from Freshwater bay. THERE IS A BOIL WATER ORDER IN EFFECT until further notice. Boil Water advisory in effect parts of Clarenville until further notice. 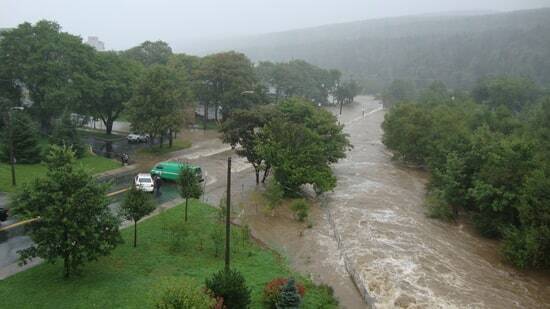 From Lower Shoal Harbour River Bridge to the TCH and all streets in between. That includes businesses on the TCH. 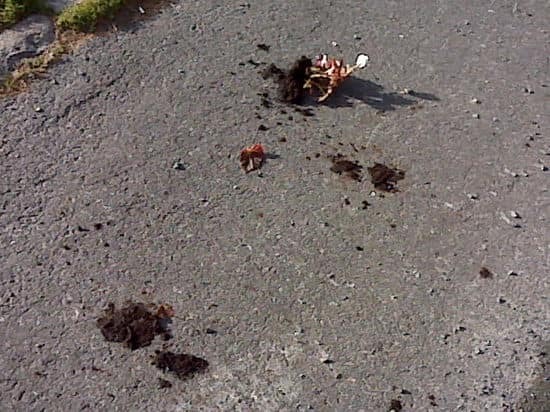 Residents of Conception Bay South are advised that garbage normally collected on Wednesday will be collected on Thursday. Thursday's garbage will be collected in Friday. Friday's will be collected on Monday. Due to power failure, no bingo at the Knights of Columbus on St. Clare Ave tonight. 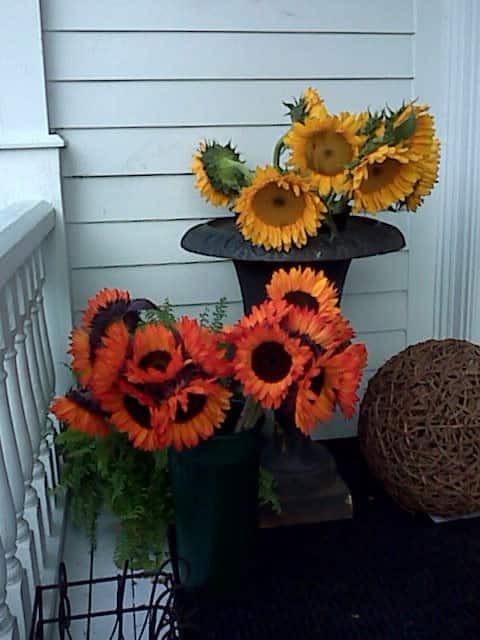 For tomorrow evening - the Autumn Equinox that was at the Lantern on 35 Barnes Road has been postponed until Wednesday Sept. 29. All classes at The Dance Centre, Queen's Road AND Coakers Meadow Plaza are cancelled this evening due to power outages. Extreme Hockey Power Skating Programs cancelled for tonight. All activities with the Prince of Wales Skating Club are cancelled for tonight. Shallaway rehearsal is going ahead this evening. Les Ms Choir rehearsal cancelled tonight. 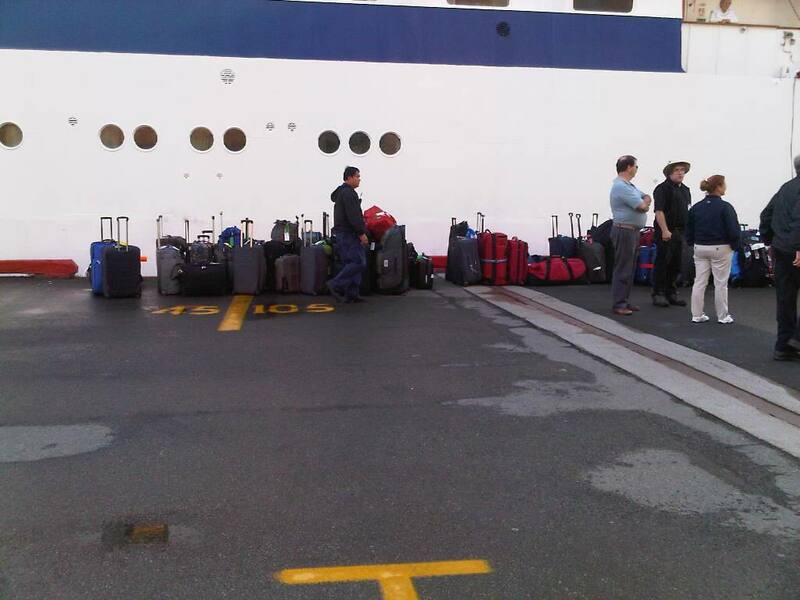 NAPE - Labour School Scheduled for Sept. 23-26 in Cancelled due to inability to get to Terra Nova Lodge. Special Olympics Mt Pearl - Tonight's Athletics Program is cancelled. 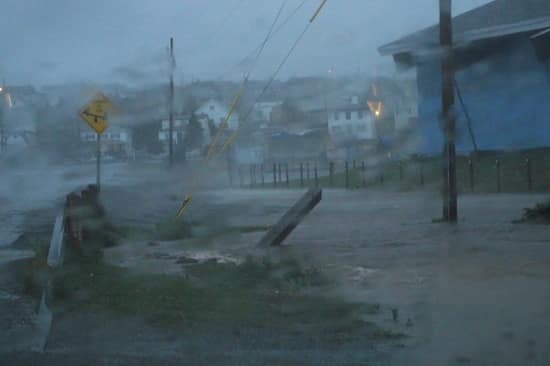 The Department of Government Services advises the public that the counter service at the Government Service Centres in Clarenville and Marystown will remain unavailable for the remainder of the day. Clinic day scheduled for the Terrenceville Clinic for Thursday, September 23, 2010 has been cancelled due to road closures to the area. Newfound Sound Rehearsal at Prince of Wales Collegiate cancelled for this evening. Mount Pearl Public Library will be closed until power returns. Update later today. Smallwood Academy in Gambo will remain closed today. The Pediatric Insulin Pump Information Session scheduled for tonight in Lecture Theatre B, Health Science Centre, St. John's has been cancelled. This session will now take place October 6. Canadian Blood Services in Gander have extended their blood collection hours. They'll be open from 1-3 today and 5-9 this evening. Service Canada Centres in Pleasantville and Placentia will delay opening their offices today due to power outages. Mary Queen of Peace Curriculum Night that was scheduled for this evening will be postponed. It is rescheduled for Monday, September 27. Primary parents will meet at 7:00 p.m. and the elementary parents will meet at 8:00 p.m.
Churchill Square Medical Clinic is closed for the rest of the day. Marjorie Mews Public Library closed. Will update when electricity is restored. All YMCA sites closed in St. John's. Update at noon. St. John's Women's center closed for the day. Bank of Nova Scotia branches with power will open at 12:00. call your branch to see if it's open. The Centre for Nursing Studies will re-open at 1:00 today for classes and labs. The Aquarena is staying closed for this morning with an update at 2:00. MUN's Field House is open. English 1080-030, with David Baird, scheduled for 9 a.m. in room SN-4068. English 1080-017, with David Baird, scheduled for 12 p.m. in room ER-1001. English 7056-001, with Brad Cllissold, scheduled for 2 p.m. in room A3033. MST 2000, with Dr. Aileen Ann Macdonald, scheduled for 1 p.m. in room SN-2036, Thursday class test postponed until Monday, Sept. 27. The Wheelway Para-Transit transportation system is currently without telephone service or electricity (9:30am). No new bookings being taken but bookings already scheduled for today are going ahead as scheduled. Pinebud Chiropractic is closed today, will re-open tomorrow. The Department of Government Services advises the public that the Government Service Centres in Clarenville and Marystown have reopened; however, there is no counter service available. An update will be provided at noon. 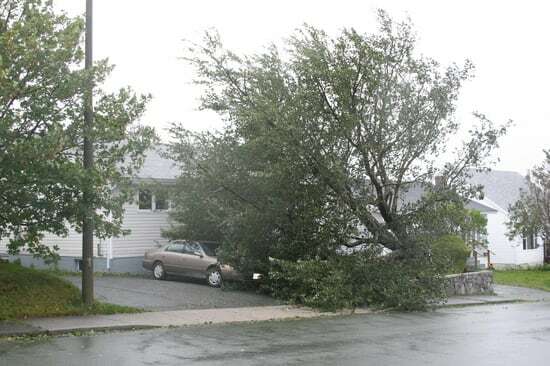 Eastern Health would like to inform residents of Bell Island that all outpatient services will be cancelled this morning at the Dr. Walter Templeman Health Centre due to debris around the facility, as a result of Hurricane Igor. As well, lab services will be opened for emergency cases only. An update on both services will be provided at noon today. Service Canada's Prince Charles Building on Torbay will also delay opening, due to a power outage. A further update on office openings will be provided at 10:30AM. Cowan's Optical on Elizabeth Ave is closed for morning, update at 1:00. The Parkinson's class at the Miller Centre is cancelled for today due to a power outage. Caller says offshore safety and survival center in foxtrap is closed. problem with integrity of incinerator road. its part of marine institute but we didn't get a notice from mun that its closed. Torbay Road mall medical clinic is closed with update at 12:00. Basilica is cancelling 9:30 a.m mass. Office closed as well. Due to the electricity outage, the former Belvedere Orphanage building, 57 Margaret's Place (off Newtown Road) is closed until further notice. Patton Building on Strawberry Marsh Road closed this morning, update at 11. Workplace health safety and compensation commission is closed this morning. update later. Ross King Memorial Library in Mt. pearl, closed this morning, update at noon. Paradise Elementary curriculum nights tonight and tomorrow evening for grades K to 6 cancelled. Morning classes at Centre for Nursing Studies on Forest Road cancelled. Update at 11:00. 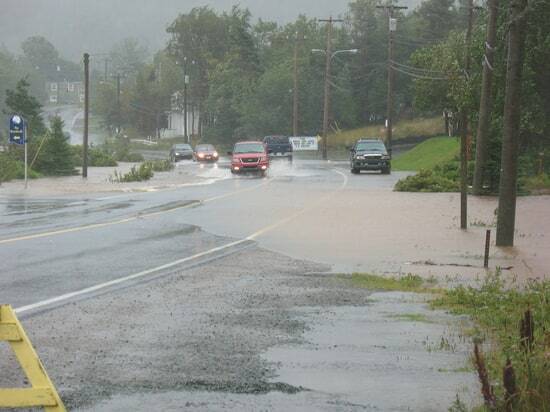 The ABE Waterford Bridge Road Center of the College of the North Atlantic is closed today because of flooding. Red House Suits daytime suit delivery will take place tomorrow from 9 to 3. Evening and pickup service will take place as usual. Devon House is closed for the day. St. John Ambulance classes cancelled for the day. Motor Vehicle Registration Building in Mount Pearl closed for the morning. Update at noon. All branches of bank of Nova Scotia around St. John's area are closed this morning, update later. Churchill Square medical clinic is closed for the morning due to a power outage. Will update later this morning. Confederation building is open; the Natural Resources building is closed. The Rooms is closed. For staff as well. Metrobus-- All routes operating, but can't service Westerland Road or Military Road between Rawlins Cross and Bannerman Road. Expect delays this morning. Please note that the Service Canada Centre in Pleasantville and the Service Canada offices at the Prince Charles Building on Torbay Road are closed due to power outages. An update will be provided at 9AM. The Children's Centre preschool in St. Mary's Church on Craigmiller Avenue closed all day. Blue Cross on Kenmount Road is closed for the morning, update at 11. The Aquarena Upper Level Fitness Centre in St. John's is closed on today (Wed) due to wind damage. Meanwhile, the Skywalk between the Aquarena and Memorial University's Fieldhouse is also closed due to wind damage. Eastern Health would like to inform residents that scheduled outpatient appointments at the hospitals in Clarenville and Bonavista have been cancelled. The cancelled outpatient clinics include: obstetrics, gynecology, psychiatry, dietitian, pediatrics, physiotherapy, occupational therapy, speech language and pathology, and diabetes education. Non-emergency admissions and procedures such as day surgery are cancelled, as well as routine lab and x-rays. Eastern Health would like to inform residents of Bell Island that there is debris located at the main entrance of the Health Centre. People requiring services during the night must use the back ambulance entrance, and are advised to call the center at 709-488-2761 prior to presenting for services. A staff member will meet them at the back entrance. Continue reading Cancellations - not school related Sept. 22. All schools in the Eastern School District staying closed for the day! CONA in Gander is opening for afternoon classes starting at 1:00. First Baptist Academy closed all day. Ecole des Grands Vents closed this morning. update later about afternoon classes. this morning with an update at 10:30. 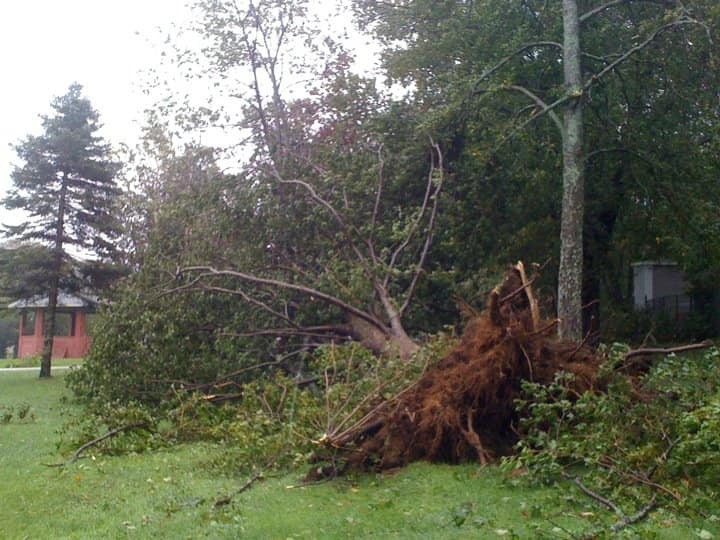 St. Bonaventure's college will remain closed on Wednesday, September 22, 2010 due to the effects of hurricane Igor. The Grade 9 Retreat will be re-scheduled. College of the North Atlantic, Clarenville Campus, will be closed all day on Wednesday, September 22nd. All schools in Vista region of the Eastern School District that runs from Arnold's Cove to Bonavista will be closed all day tomorrow. Marystown Central High School will be closed Wednesday morning, September 22, with a further update at 10:30 a.m. regarding the status of afternoon classes. 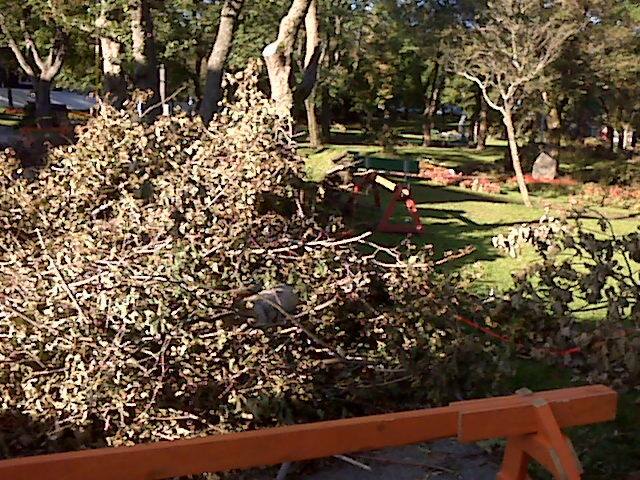 Geoff Heffernan comments: This is where 2 trees fell down in our yard today due to Hurricane Igor! Photo sent in by Geoff Heffernan. 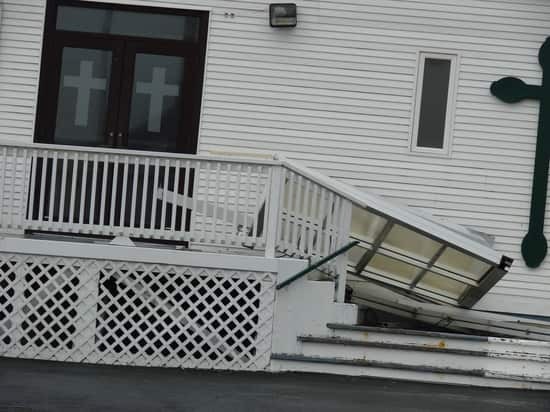 Brenda Sweeney comments: Damage Done To Bell Island Hospital & Church. Photo sent in by Brenda Sweeney. 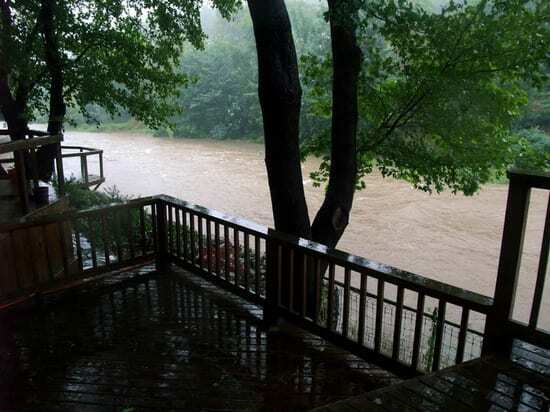 Toni Jerrett comments: This is normally a small river with a foot or two of water in it.It wasn't like that today during Igor. Photo sent in by Toni Jerrett. 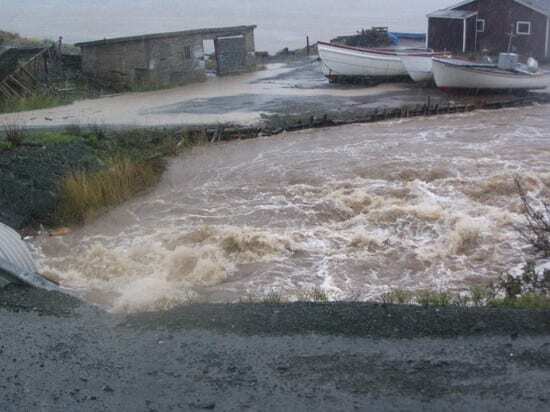 Melanie Batten comments: Here are some photos of Conception Bay south from Manuels River, Foxtrap marina (the railway track area), the ocean, and local stores under water. Photo sent in by Melanie Batten. Wayne Herridge comments: New skate park Marystown. 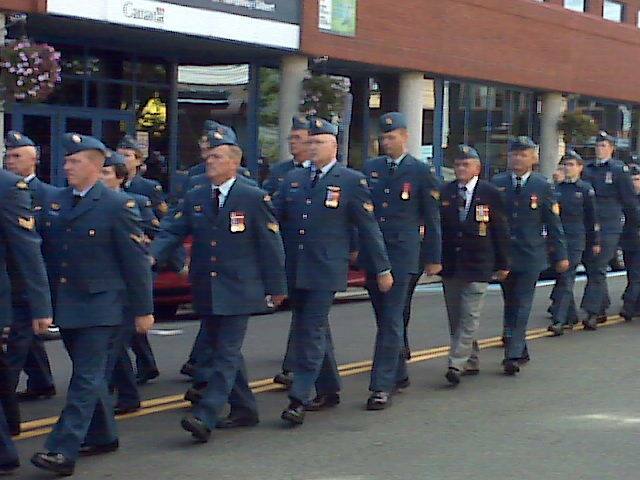 Photo sent in by Wayne Herridge. Burgoynes Cove. 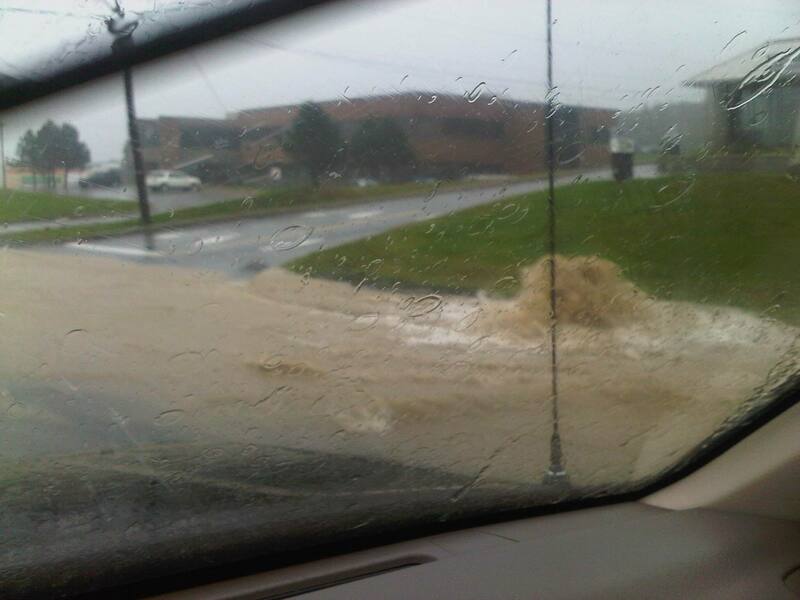 Photo sent in by Karla Hoskins. Horseshoe turn in Elliots Cove. Photo sent in by Karla Hoskins. Britannia. 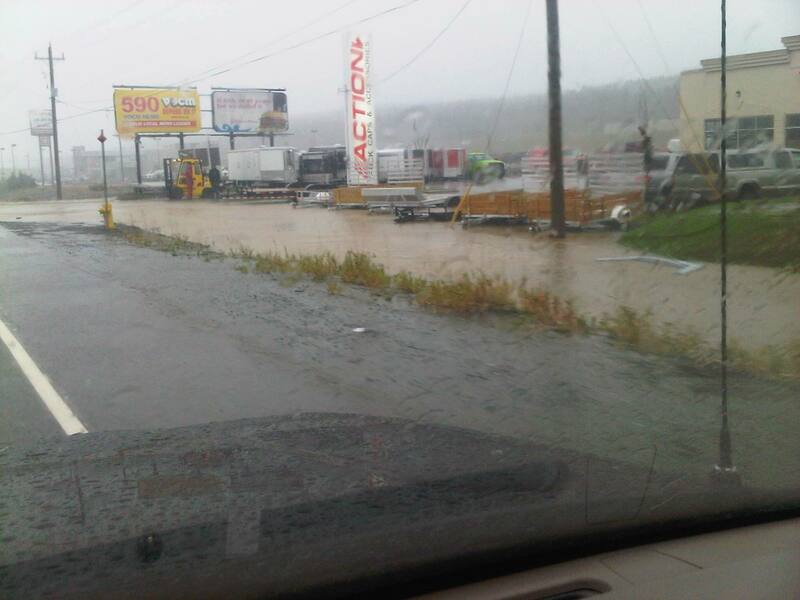 Photo sent in by Karla Hoskins. George J.B. Rose comments: Little Barsway bridge 10 km north of Grand Bank. Photo sent in by George J.B. Rose. 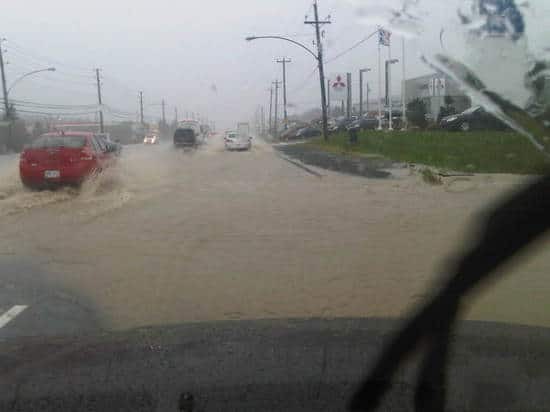 Judy Bennett comments: Flooding going east on Kenmount Road, Noon, September 2. Photo sent in by Judy Bennett. Bannerman Park in St. John's. Photo sent in by Stuart Mair. 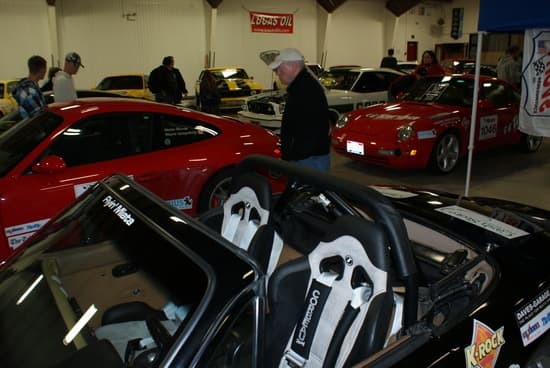 Dave Sheppard comments: Dunn's Bridge Mt. Pearl and Bowring Park. Photos sent in by Dave Sheppard. Photo sent in by Kurtis Billard. 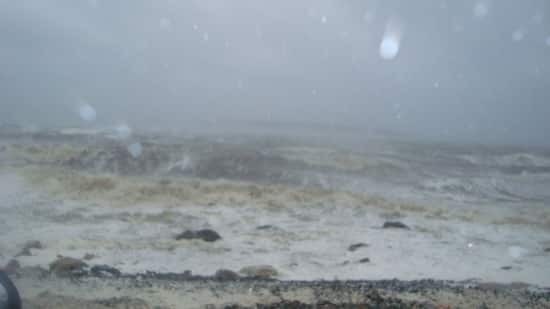 Images from Bay Bulls sent by Lana Williams. Dann Dober comments: The rush of water when the road gave way took a building and just left the step. 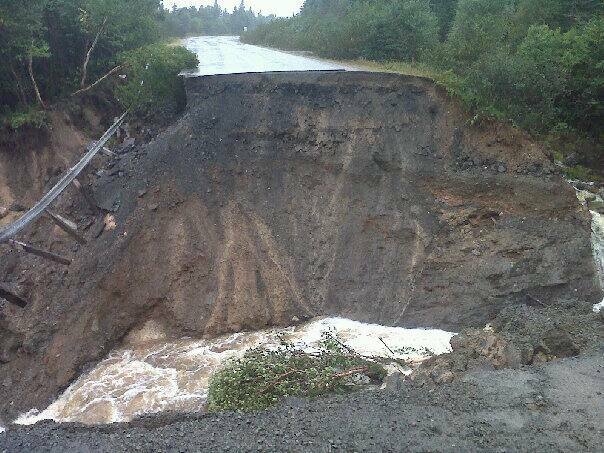 Dann Dober comments: Road washout in the community of Beau Bois, Burin Peninsula. Photo sent in by Dann Dober. Robyn LeGrow comments: Tree fallen in front of my house on Diana Rd. 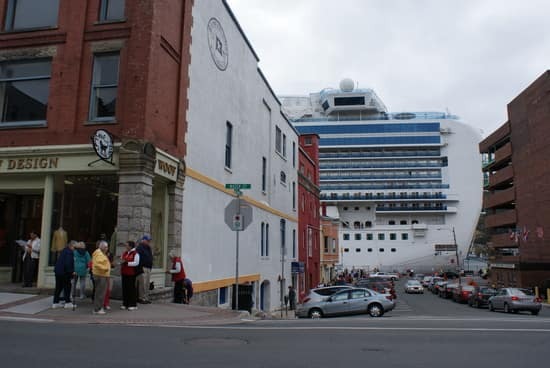 in St. John's. Photo sent in by Robyn LeGrow. 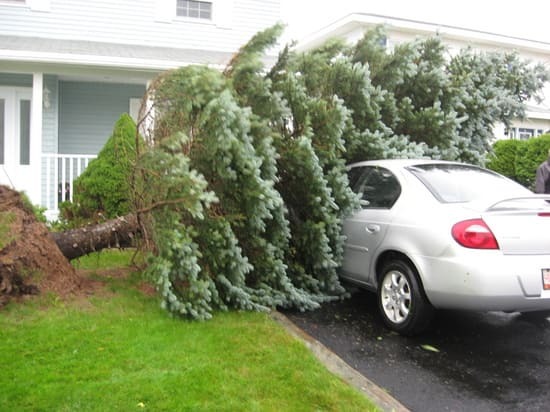 Brian Kelly comments: Hurricane Igor blows a 20 yr old blue spruce down across car. Patrick Rouzes comments: Just watched these huge trees in my backyard snap like twigs & fall in a matter of seconds (3:15 pm-September 21,2010). There are also powerlines down in the backyard. Have not seen anything like it before. Hope everyone stays safe. Photo sent in by Patrick Rouzes. 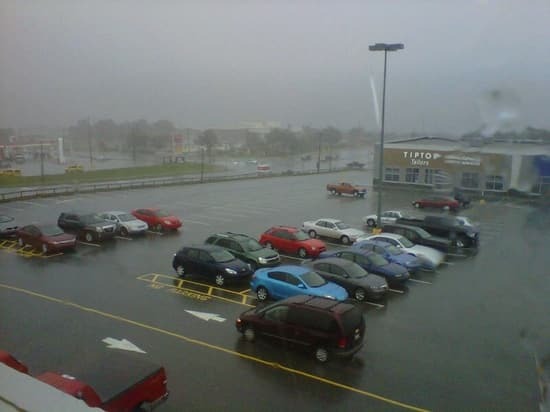 Steve Delaney comments: Parking lot at Mount Pearl Square at about 4 pm, Sept 21, 2010. Light pole blown over by Igor strikes car and truck. Photo sent in by Steve Delaney. 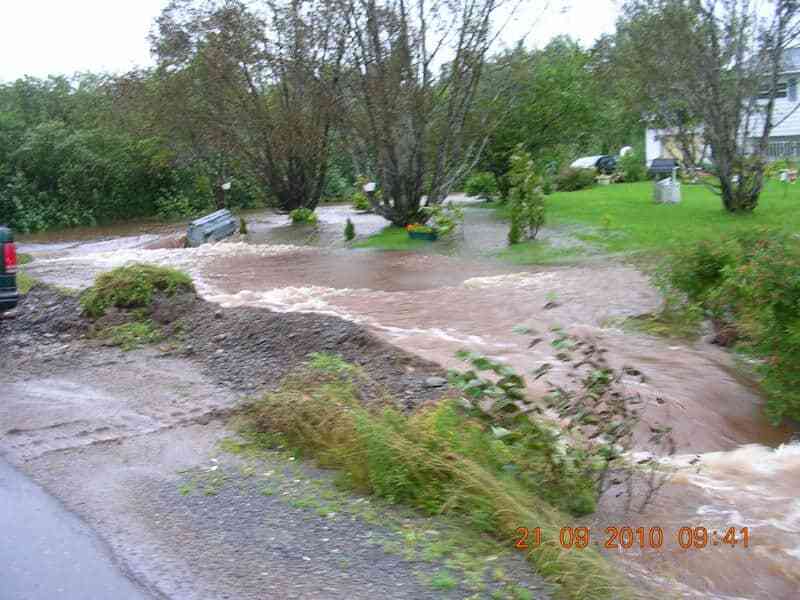 Josh Maloney comments: Water was flowing over the pavement so they had to dig out the main road to let it settle down. 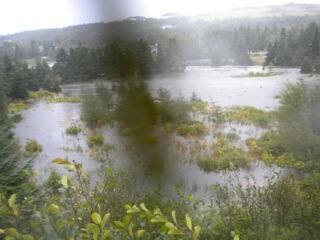 This was taken in Drakes Cove, Marystown. Photo sent in by Josh Maloney. 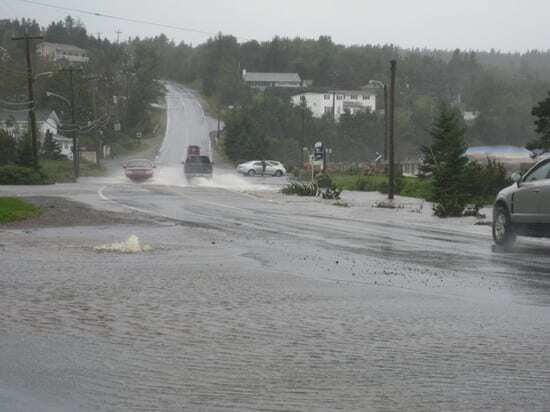 Ulf Teschendorff comments: Tilley's Road South at Route 60 in Conception Bay South. (Next to the Kelligrews post office. Photo sent in by Ulf Teschendorff . 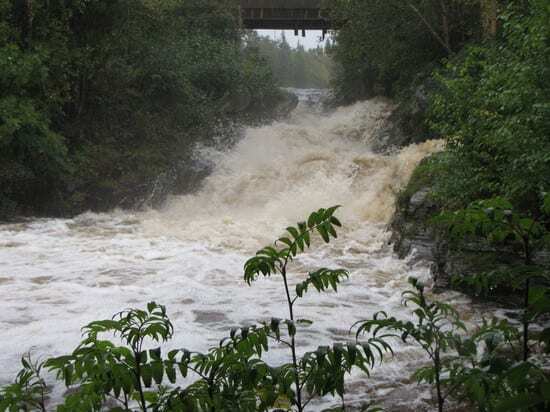 Ulf Teschendorff comments: The river between Conception Bay South and Holyrood on Route 60. Photo sent in by Ulf Teschendorff. Peter Miles comments: Golf ave...where will we hang the hammock now? Photo sent in by Peter Miles. 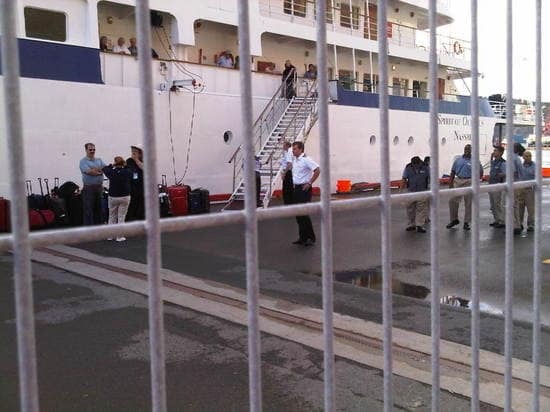 Robyn Collins comments: photo of Igor in St. John's NL. Photo sent in by Robyn Collins. 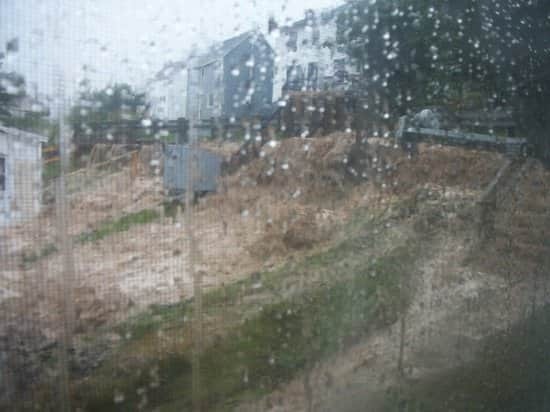 Irene Rahman-Whittle comments: Chance ove road washed out! Photo sent in by Irene Rahman-Whittle. These pictures were taken this morning by Jennifer Barrett of North Harbour. They lost one bridge and are experiencing lots of washouts and flooding on the roads. 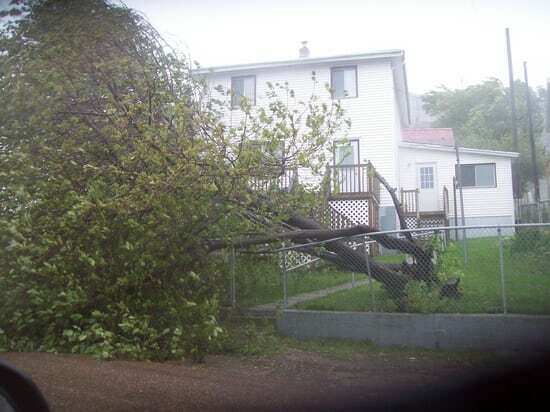 Christine Gillespie comments: Hurricane Igor pictures taken in Carbonear. Rhonda Fitzgerald comments: This is my aunt's driveway. The trees and bank have been washed away from the road into her garden. 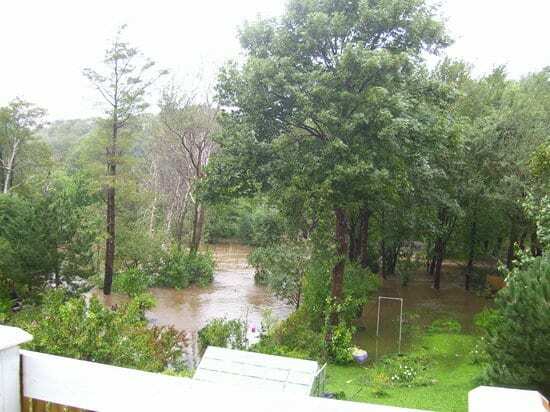 The brook running through her garden has overflowed and is threatening her house. Photo sent in by Rhonda Fitzgerald. 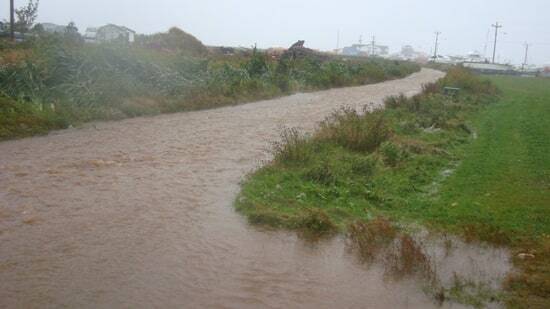 Sharon comments: Main Rd by the beach in Holyrood. 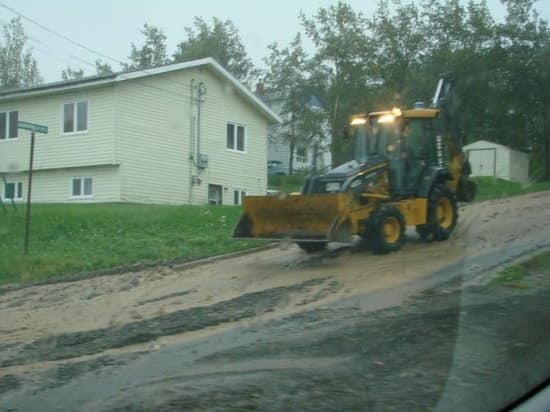 Chris Wells comments: Kenmount Road, St. John's. Photo sent in by Chris Wells. Nik Makrets comments: Rennies River below Empire ave Sep21 2:30 pm.Photo sent in by Nik Makrets. 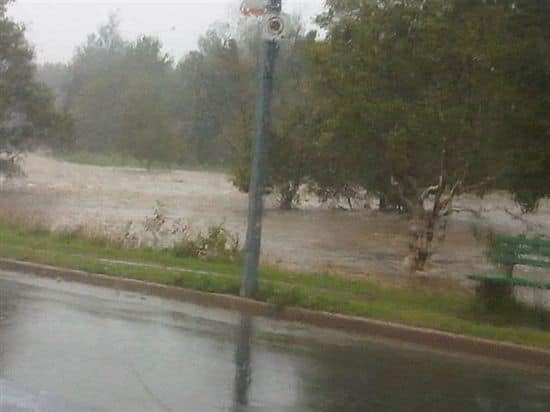 Here's a picture taken around noon of the water from Boland's Pond starting to overflow onto Route 60 in Holyrood and another of the washout of Joy's Road in Holyrood. Photo sent in by Tonji Stewart. 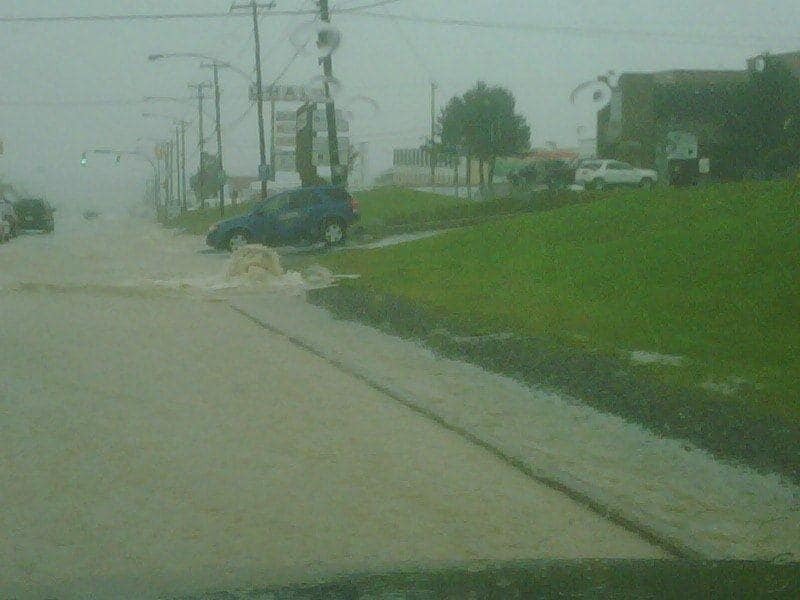 Topsail Road near Mount Pearl/Paradise border. Photo sent in by Frank Anstey. 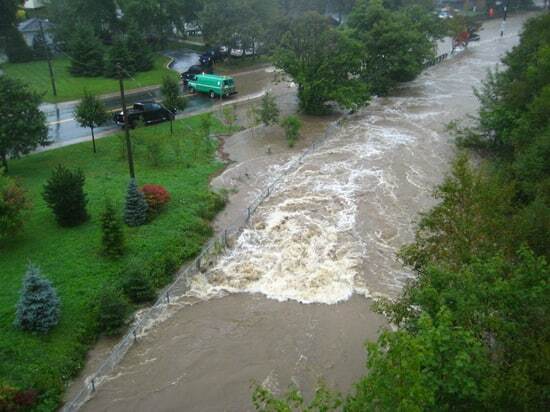 Jennifer Russell comments: This is the lovely little brook behind my house... not so lovely now... They're making a new road and diverted the river... probably not a good idea! Photo sent in by Jennifer Russell. Main Road in Chance Cove during Hurricane Igor.Photo sent in by Irene Rahman-Whittle. Frank Anstey comments: Shot from Columbus Drive overpass. Photo sent in by Frank Anstey. Derrick Edwards comments: Waterford Bridge Rd. 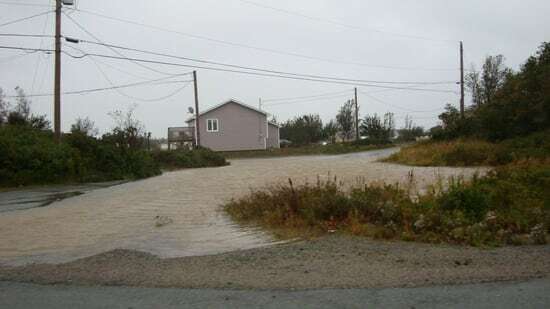 Tony Rye comments: Chance Cove, Trinity Bay. The green bridge in the background right used to cross to the small island in the centre of the photo. Photo sent in by Tony Rye. 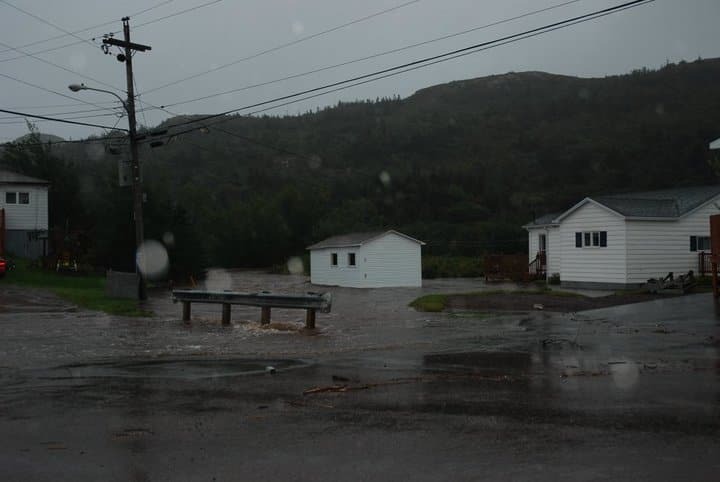 Pics of Kenmount Road St. John's sent in by Trevor Patey. 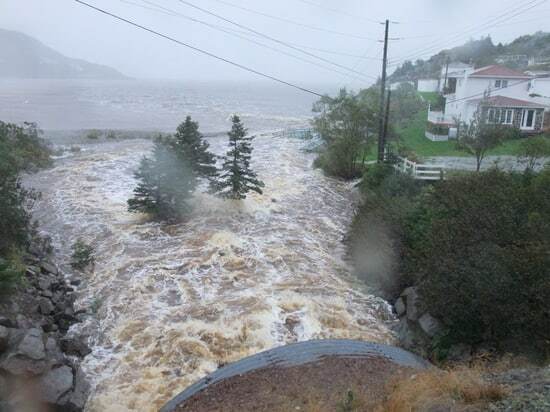 Bonnie Trimm comments: This was taken during Hurricane Igor of the Grand Bank break water. Trudy Poole comments: a tree that the wind has taken down , and crashed into the middle of the street. Photo sent in by Trudy Poole. 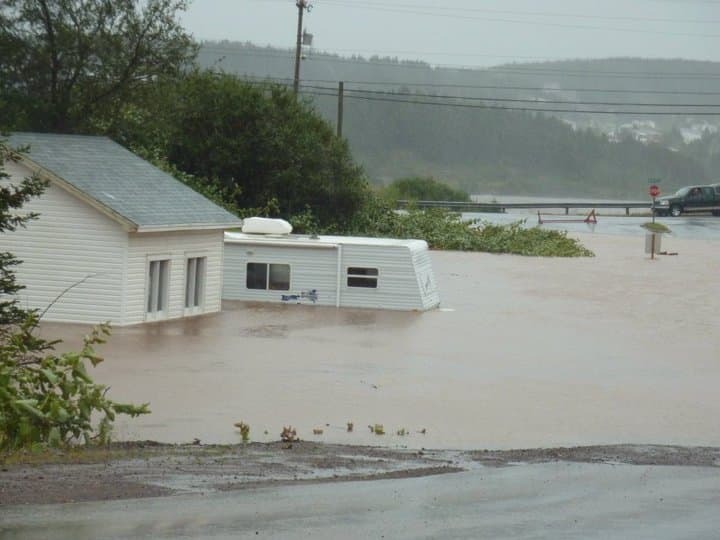 Doreen Strickland comments: Flooded in King's Cove. 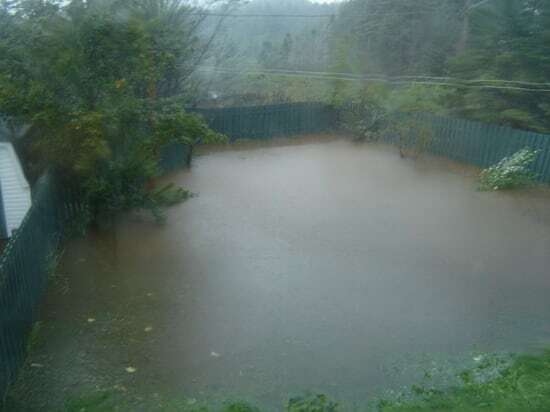 Darlene Joe comments: Our swimming pool again South East Falls Conne River ,pic was taken during the rain storm, Sept. 21, 2010. Photo sent in by Darlene Joe. 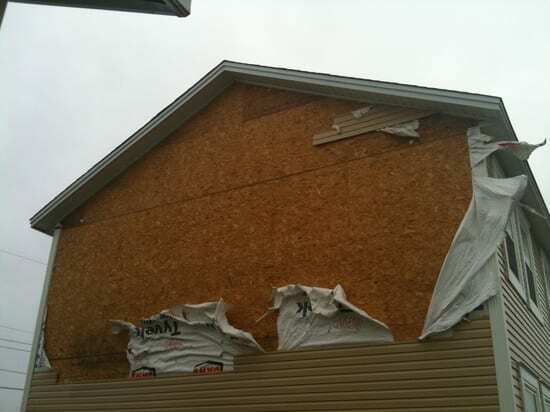 Adam Power comments: The waterfall on the side of our house in St. John's. 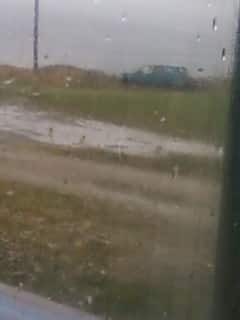 Darlene Joe comments: OUR swimming pool during the Rain storm, Sept. 21 2010. 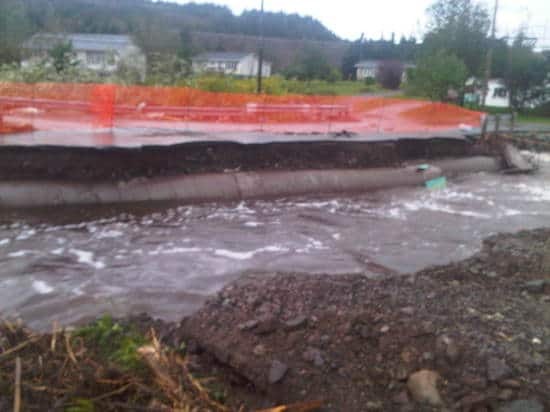 Kaity Smith comments: My father, Terry Smith, took these photos of Sunnyside today after the culverts washed away taking portions of the roads with them. Photo sent in by Kaity Smith. 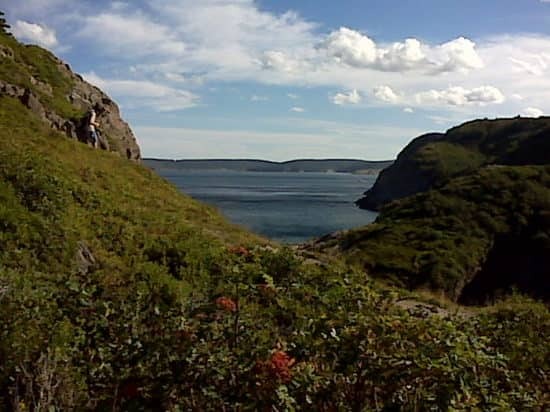 Katie Cabana comments: Hickman's Harbour, Random Island. 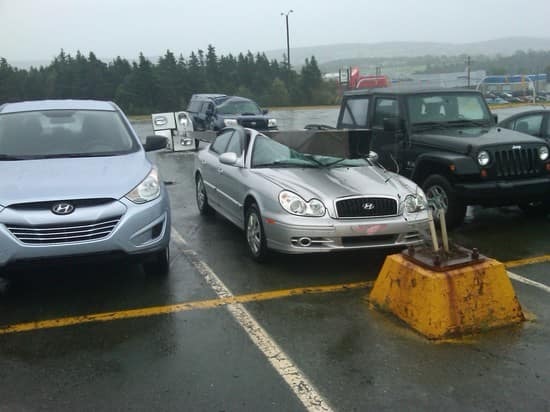 Leona Meaney comments: Village Mall parking lot in St. John's. Waiting for the worse to come. 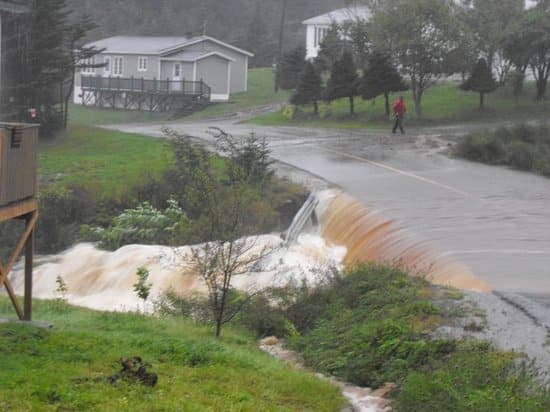 Ann Quinton comments: Culvert washed out in Charleston, Bonavista Bay. Photo sent in by Ann Quinton. P.E. Coristine comments: This is the view from our back deck of the Waterford River this morning at around 11:30 am! Photo sent in by P.E. 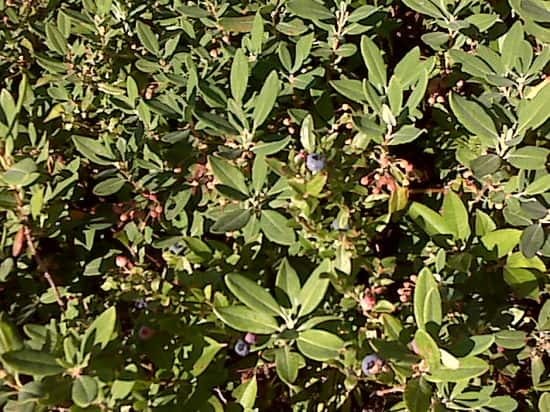 Coristine. Musgravetown/Bloomfield: Bloomfield Main Road @ 08:30. Photo sent in by Dave and Kerri Peach. 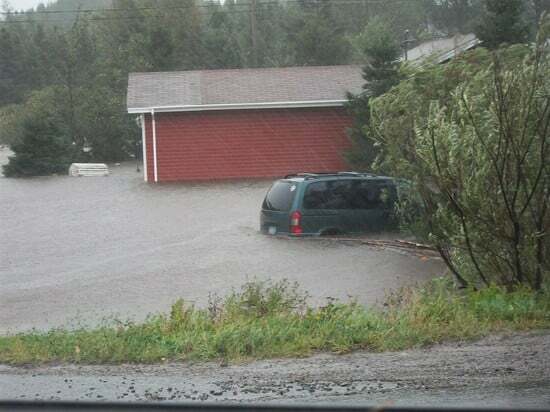 Musgravetown/Bloomfield: Musgravetown Driveway ( Not sure who lives there ) 08:30.Photo sent in by Dave and Kerri Peach. Shara Button comments: Rain coming down on Terra Nova Rd. Photo sent in by Shara Button. 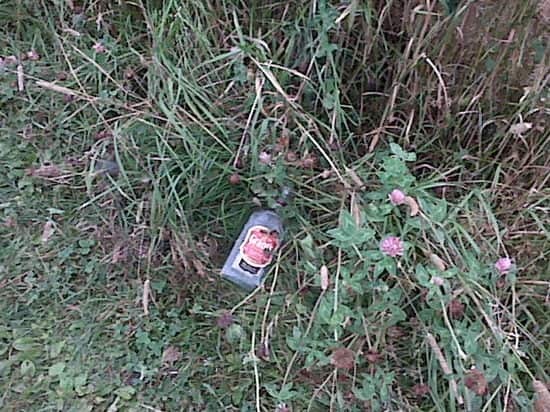 Wayne March comments: Photo taken this morning at Lady Cove, Random Island. 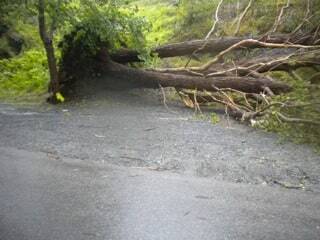 Roads are washed out in many areas of Random Island. Photo sent in by Wayne March. 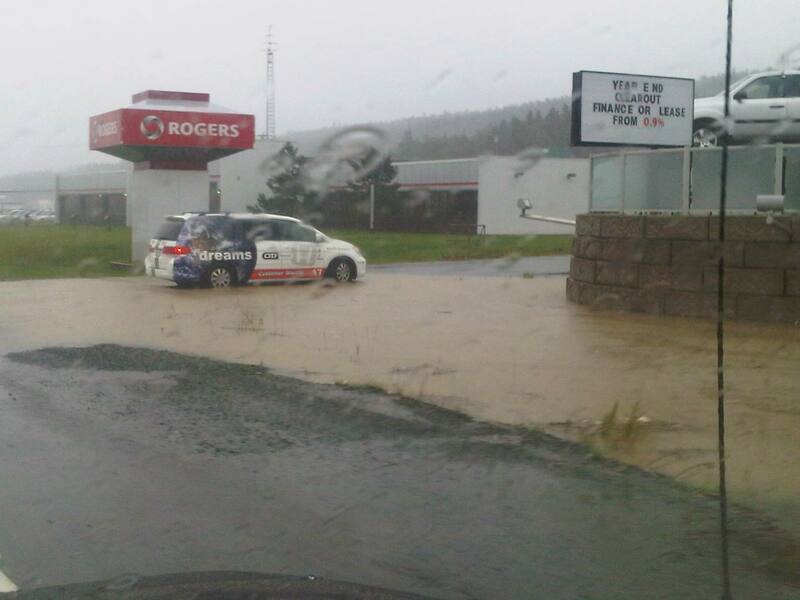 Photos from Clarenville where a state of emergency has been declared. 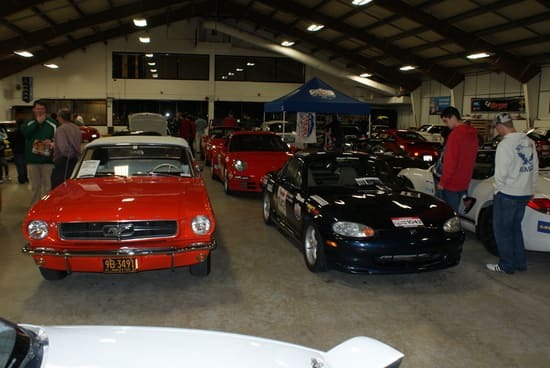 Photos sent in by Paul Tilley. Dwight Sheppard comments: Creston North, Marystown. Photo sent in by Dwight Sheppard. 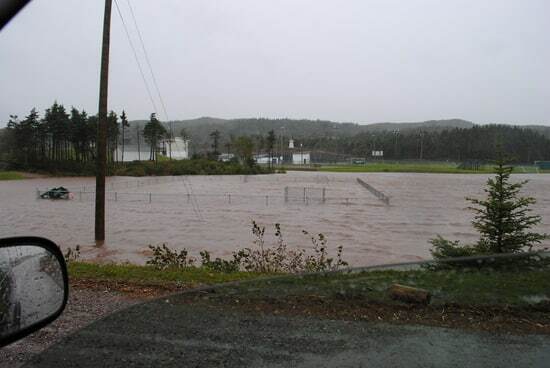 Dwight Sheppard comments: This photo is of Creston South, Marystown. The roads have totally let go. Photo sent in by Dwight Sheppard. The view looking across the harbour in Wreck Cove. Taken at around 9:30 am Tuesday morning. Photo sent in by Sheena Best. 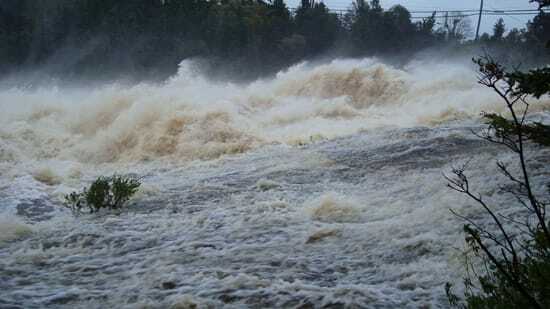 Flooding, Heavy water build up caused by Hurricane Igor in St.Lawrence. 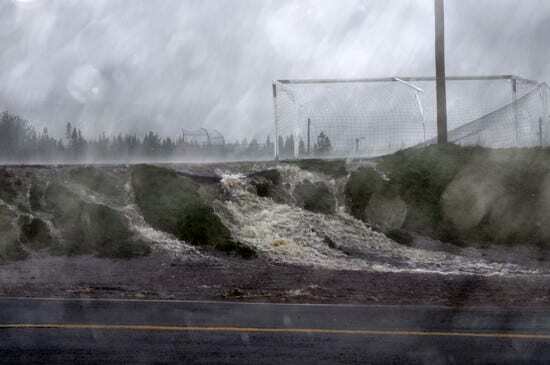 Water gushing off the Memorial Soccer Field unto the main highway ( Route 220) ..the field is a swimming pool of water! Water, soil & rocks cascade down over the field unto the road & ditches. Photo sent in by Cynthia Farrell. Random Island. Looks like there was a landslide. Debris followed this brown in the water, including what appeared to be a fridge. Photo sent in by Katie Cabana. River Head St.Lawrence. 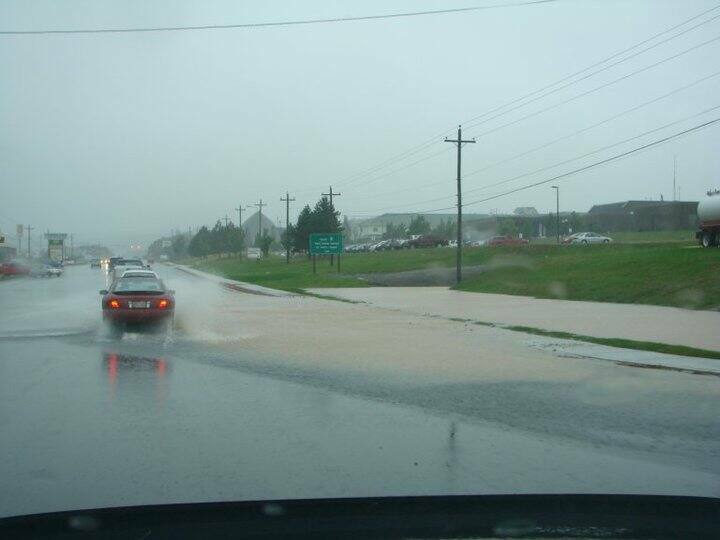 Photos sent in by Martha Brewer. 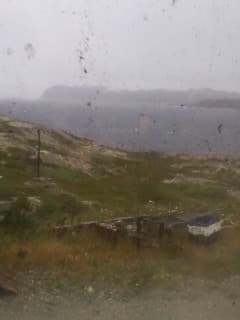 This is Twillingate harbour with all the wind, and the puddle in front of my house. 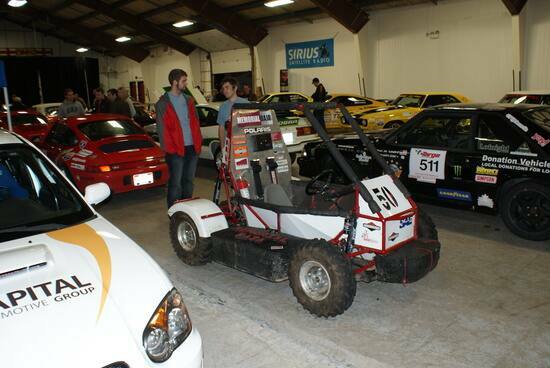 Photos sent in by Andy Percy. 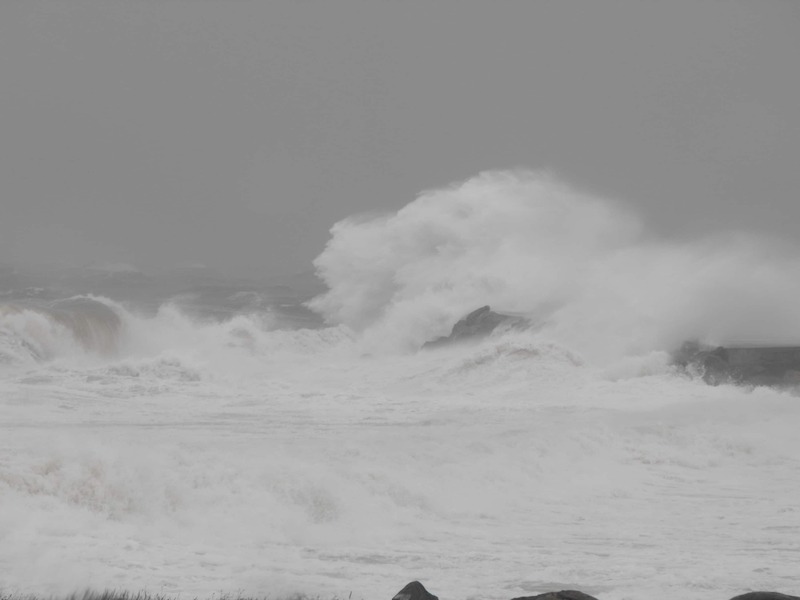 This was taken at 8:30 this morning from the south side of Harbour Breton across to the North Side. It was raining too hard to take a sensible picture.. Photo by Beulah Drake Hr.Breton. 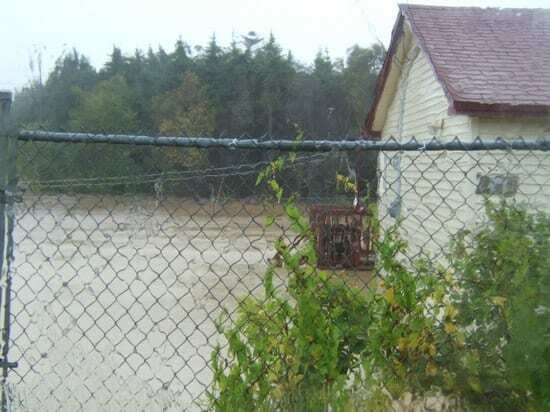 A backyard in Marystown. Photo sent in by Craig Hutchings. Epworth on the Burin Peninsula. Photo sent in by Frank Brinston. Please stay off the road except in an emergency situation. Also, the ferry service between Fogo Island and Farewell is currently not running. Update from Clarenville Coun. Keith Rodway. 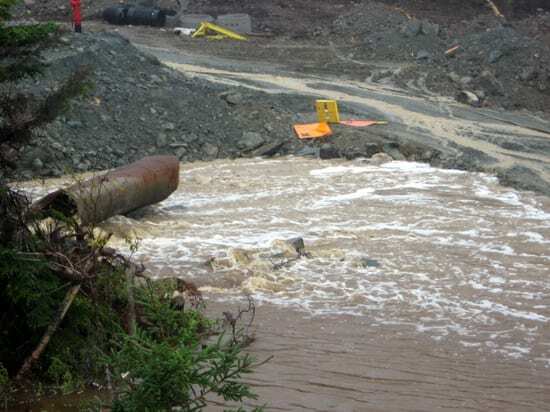 Water is still off for many residents in Clarenville and will remain off for most of tomorrow. Also, the Salvation Army will be putting on breakfast at the Clarenville Middle School beginning at 7 a.m. for anyone who needs breakfast. It will remain open until everyone is fed or they run out of food. Patients on home oxygen or ventilation who are without power and who are concerned about the level of their battery back-up, should call their equipment supplier. All suppliers for home oxygen or ventilators provide 24-hour support services and will be able to provide assistance. The TCH is open now from St. John's to the 230 interchange. From route 230 interchange to Port Blandford is still closed. 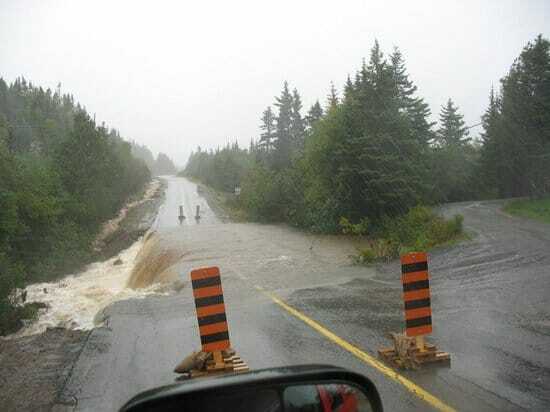 A section 6 kms West of Gander on the TCH that is closed as well. These are the only areas of the TCH that remain closed. 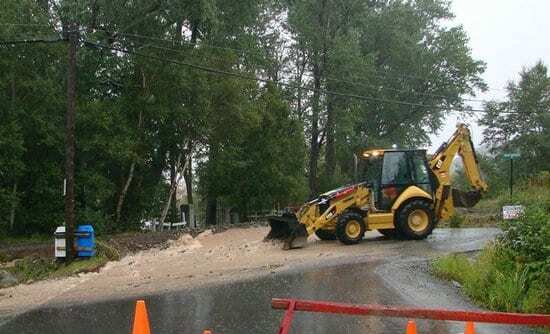 Town of New-Wes-Valley: due to numerous road washouts and downed powerlines the town has declared a state of emergency and advises residents to stay off the roads unless it's an emergency. Please be advised if you have an emergency all essential emergency services have been transferred from Brookfield hospital to Bonnews lodge. Town of Glovertown residents are being told due to the length of the power outage the council is issuing a boil water advisory effective immediately. RCMP on Bell Island is at the Bell Island Hospital investigating a report of wind damage to the front roof of the hospital. A portion of the front section of the roof has lifted and blown over the main entrance. 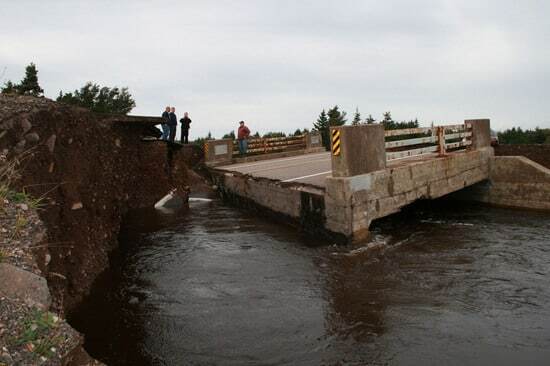 According to the RCMP in Holyrood the bridge at the border of Seal Cove CBS and Holyrood Town line, on Route 60 has water damage to the north side of the embankment. The river is running high and fast with water moving over the paved portion of the road way. Works Services and transportation have been advised. Drivers are asked to drive slowly when approaching this area as there is no warning signs to advise of the damage to the embankment. 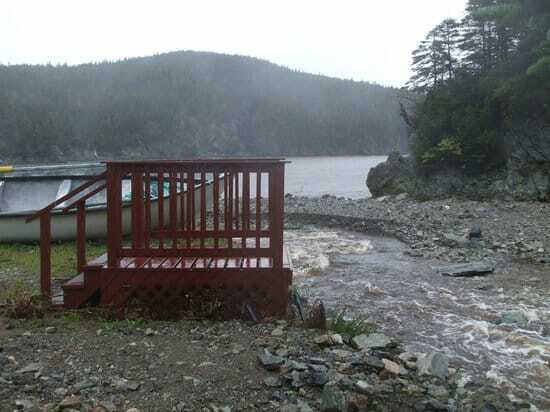 Town of Gander says the power is gone to the reservoir and people are being asked to conserve water... they're trying to get a generator in to rectify the situation. 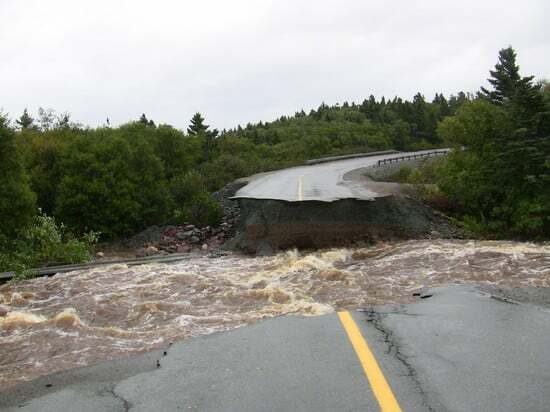 The Department of Transportation and Works advises that, due to numerous road washouts and other damage, many of the roads on the Bonavista and Burin Peninsulas are impassable. Motorists are advised to stay off all roads in these areas and that traffic should be restricted to emergency vehicles only. 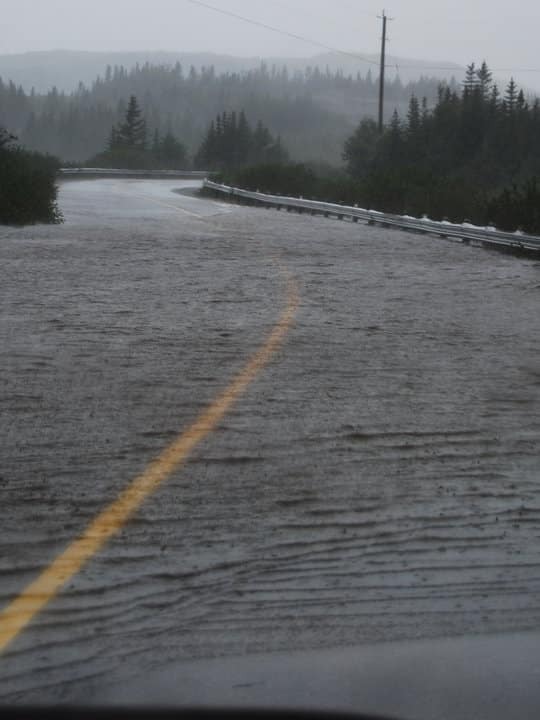 The Trans-Canada Highway (TCH) is closed between Whitbourne and Port Blandford. Route 13 - Witless Bay Line. 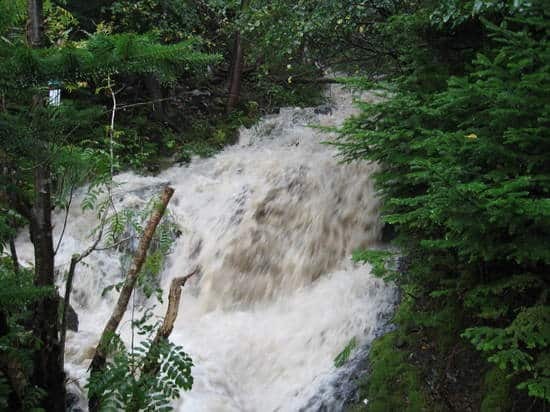 Motorists are also asked to use extreme caution on Route 2, Pitts Memorial Drive, due to water and debris on the roadway approximately two kilometres east of Kilbride. The TCH at Joey's Lookout near Gambo has been re-opened. The Department of Transportation and Works and Fire and Emergency Services - Newfoundland and Labrador are continuing to monitor the storm and will co-ordinate efforts with affected municipalities. Transportation and Works staff will continue to monitor conditions and make road repairs as conditions allow. The department is asking the public not to travel the roadways unless it is absolutely necessary. 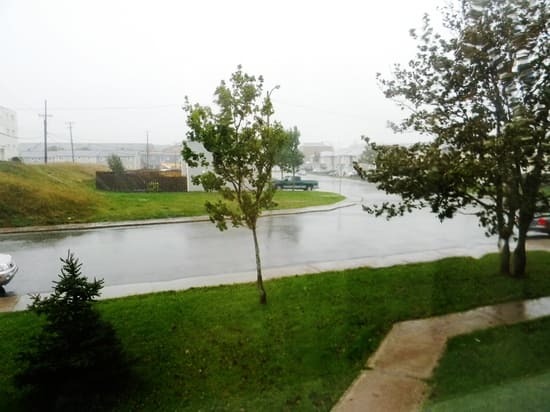 The Royal Newfoundland Constabulary is issuing an advisory to the general public to remain off of the roadways within the city due to the severe weather conditions. 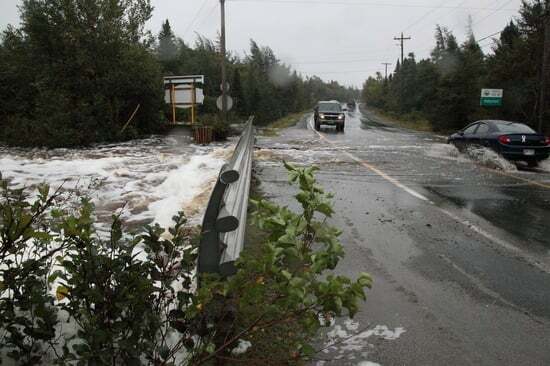 RCMP ADVISE THE PUBLIC THAT ROUTE 330 BETWEEN DEADMAN'S BAY AND MUSGRAVE HARBOUR IS CLOSED UNTIL FURTHER NOTICE. From RCMP: TCH east of Gander is closed. RCMP are at intersection of Cooper and TCH, waving traffic back. Terra Nova, TCH completely washed out. 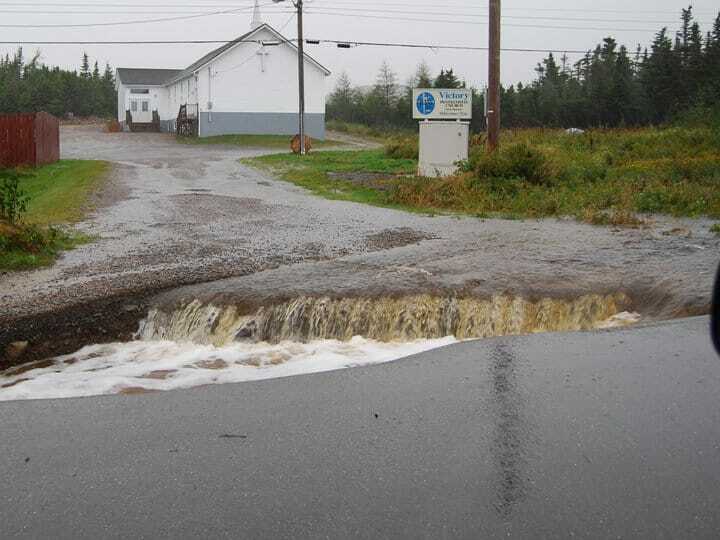 Glovertown, Gambo and Eastport areas have roads completely washed out. 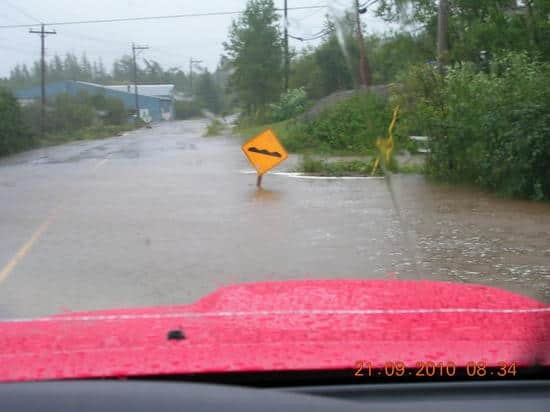 Route 330 to Carmanville, near a place called Smith's Waters, between Gander and Jonathan's Pond Park is in danger of closing, heavy water buildup. Bridge on intersect of Logy Bay and Lower Road is closed due to flooding. Residents in area have to access their homes via Torbay Road. 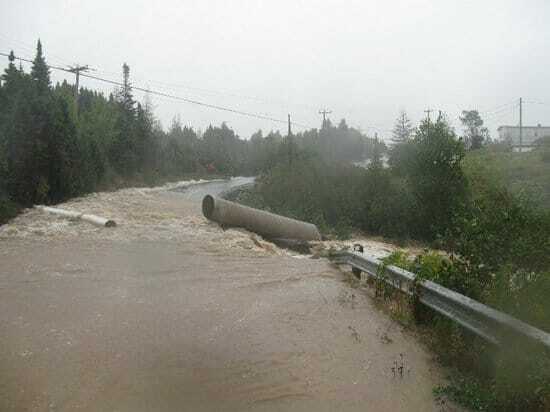 -advise to use main caution: on main road in Portugal Cove Road, Thorburn Road and Beacy Cove Road. Major washouts on all of them. 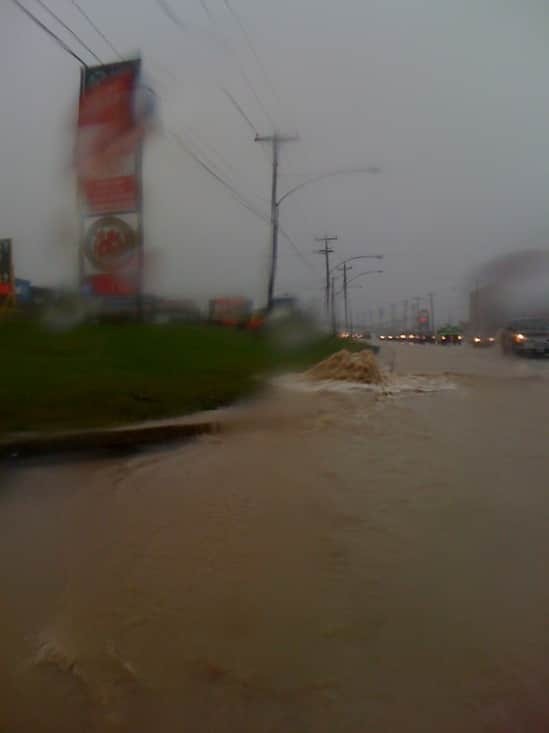 Roads washed out in Long Harbour. Employee from Vale just came off the access road and says a river is running across it and it will soon be impassable (2pm). Dept. 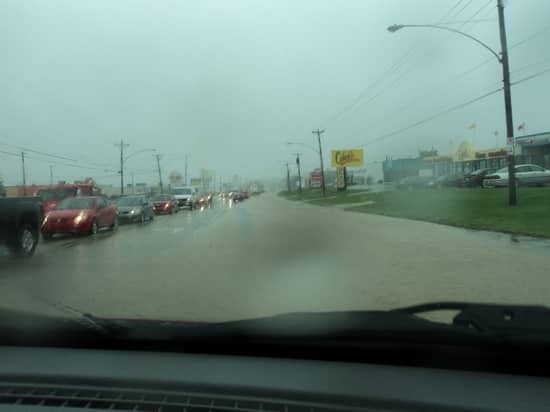 of Transportation are asking drivers to avoid the Witless Bay line , due to flooding in several parts of the roadway, that may cause washouts. 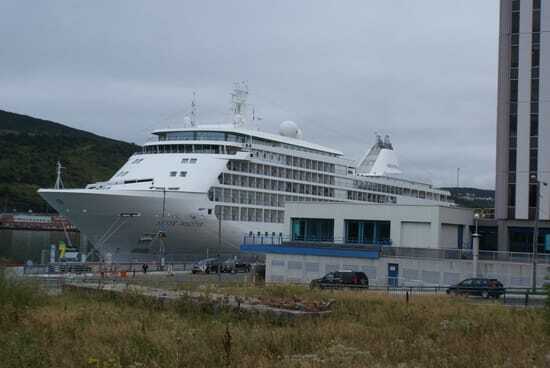 In Holyrood, avoid the Main Beach area Route 60, where the Star of the Sea is located. The water level has increased on the road way and one home has been flooded in that area. Take the Holyrood Access road or the Salmonier Line up to the trans Canada Highway. Access to the ramp to travel off what is referred to as the Chicken Farm road to the east bound Trans Canada Highway , at the Paddy's Pond over pass is totally submerged. The side road that gives access to the Wildlife and Islander RV is also submerged. 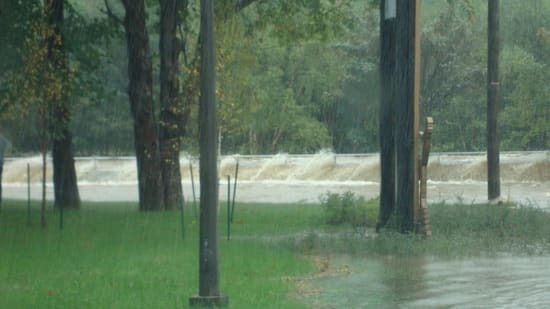 River flowing over Route 60 between CBS and Holyrood. Blackmarsh Road (from Canada Drive to Topsail Road - area of cemetary - towards Mt. Pearl) closed. Road is anticipated to be open by approximately 11:45 p.m.
Lawlors Road in Paradise is flooded. Lots of callers say there's deep water on Waterfordbridge Road below Bowring Park. Blackmarsh Road-Canada Drive- Topsail Road area near the cemetery closed. Oxen Pond Road...the dirt road part through O'rien's farm on the hill..closed. 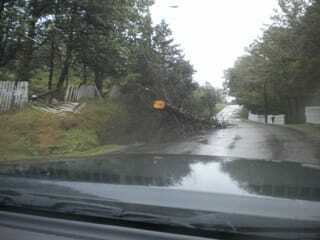 Heavy Tree Road in the Goulds closed. 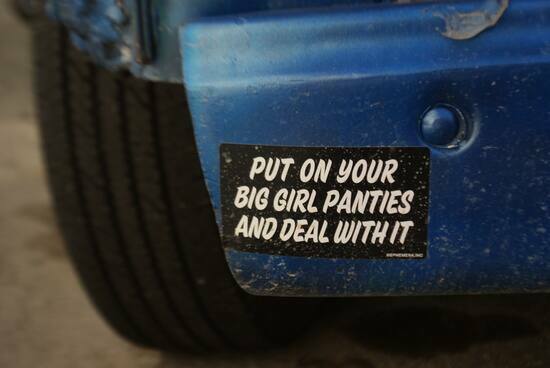 Otherwise, no severe problems. Just advising people to stay off roads unless absolutely neccessary. -- Marine Drive (outside of St. John's) culvert washed out, but road still passable. 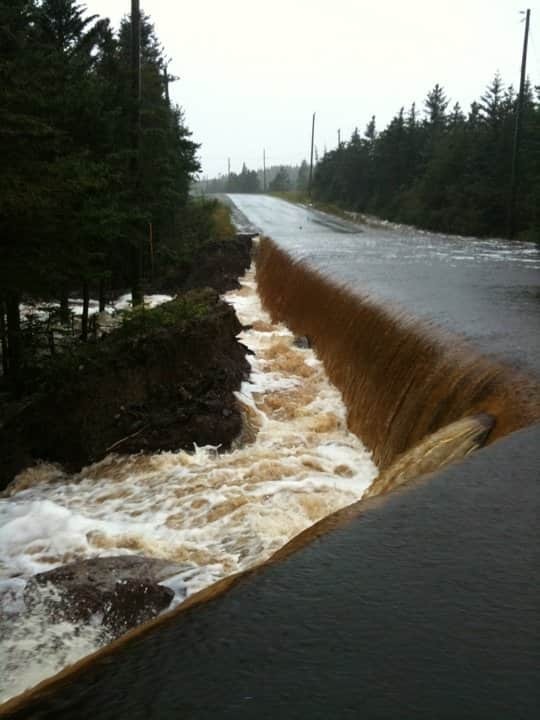 -- road from St. Lawrence to Marystown washed out or soon will be. 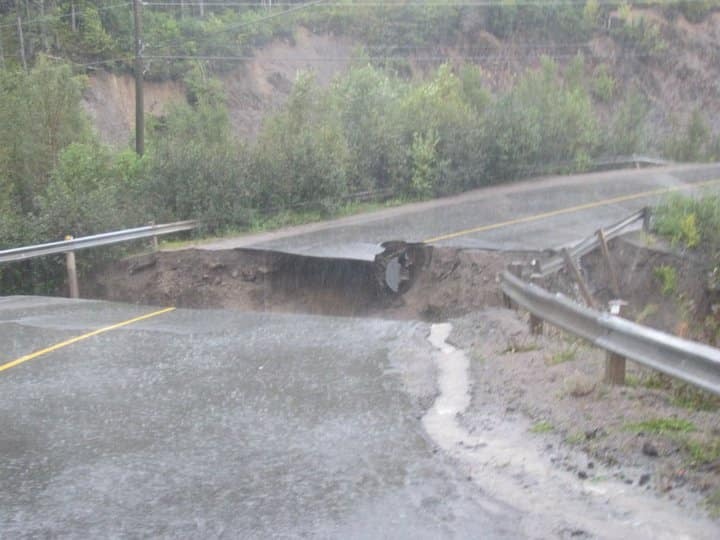 -- road between Goobies and Marystown closed because bridge is gone. 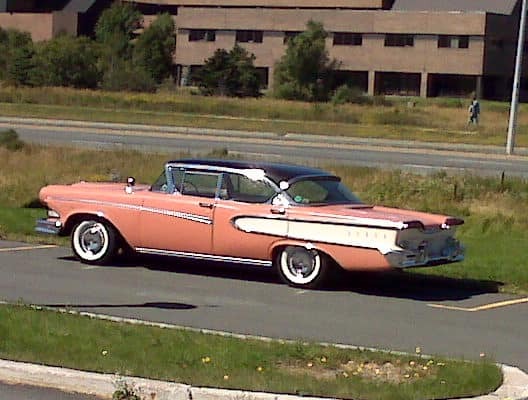 -- pressures on road in Port Rexton, Clarenville, Belleview, Goobies. -- road to little Salmonier is washed out about to wash out. in emergency situations; however the public is asked to avoid Route 301. 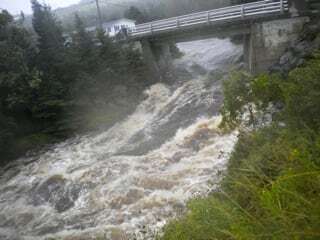 -- Main Brook bridge in Hodderville on Bonavista Peninsula is washed out. 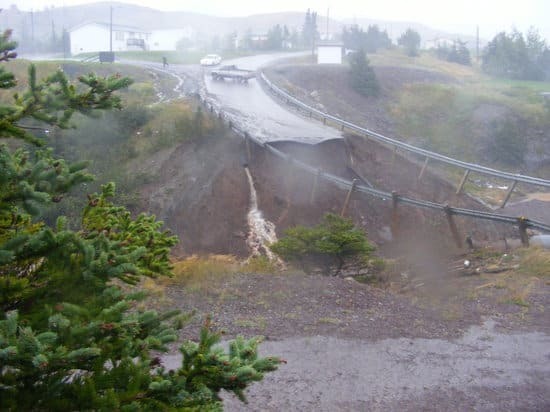 --in Bonavista, one of the main roads is washed out, the other is close to it. 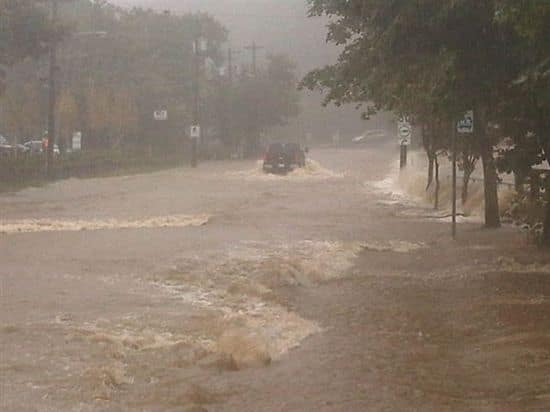 Lots of flooding in the town. Flooding in basements is moving upstairs. they're looking at setting up a shelter at the school. -- roads to communities surrounding Trinity are washed out. 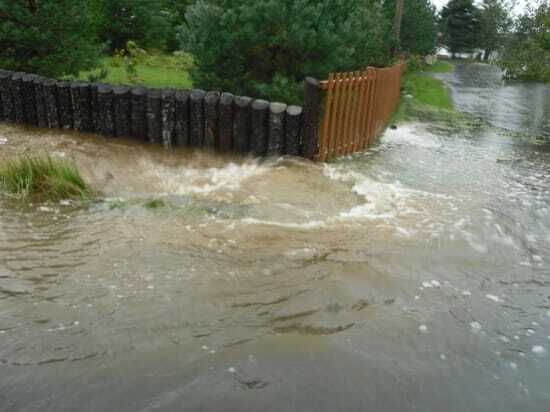 -- Roads in Sunnyside (state of emergency) are closed. 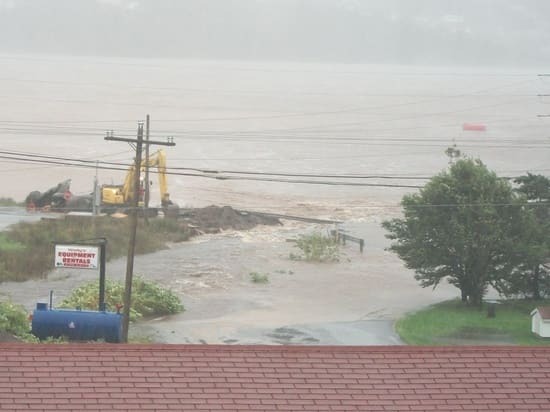 Water main and sewer main washed out into harbour. 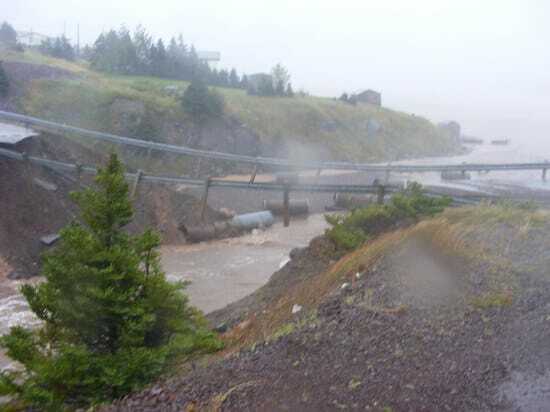 -- TCH by Clarenville is closed, and by Goobies. 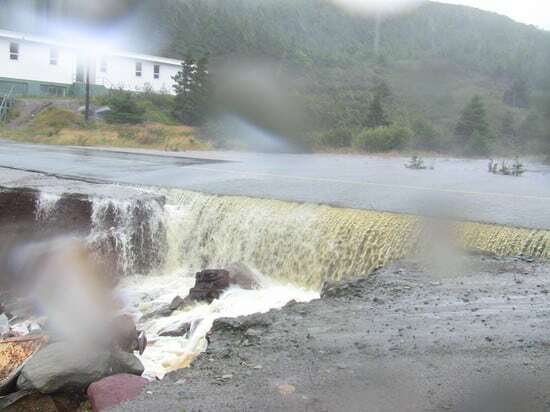 -- The Burin Peninsula Highway is closed. -- TCH closed at Clarenville heading east. 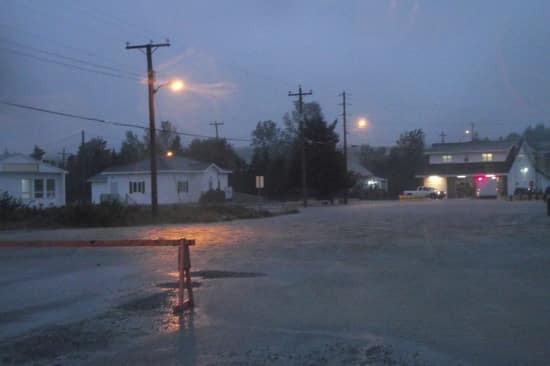 -- St. John's in the area of New Cove Road and Elizabeth Ave.
--Town of Port Blandford: They have opened the Royal Canadian Legion for drivers and passengers stranded on the highways. Providing a haven there. Soup and sandwiches..haven't declared state of emerg yet - still have water, still have power. TCH is closed. 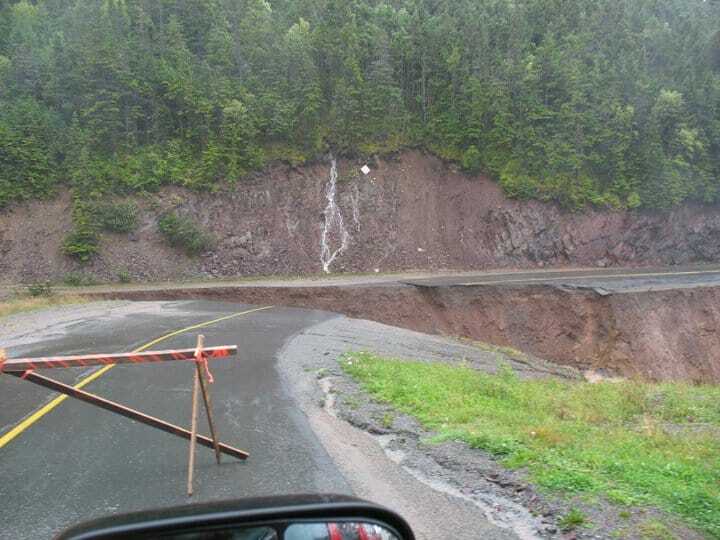 Road to Bunion's Cove is closed. 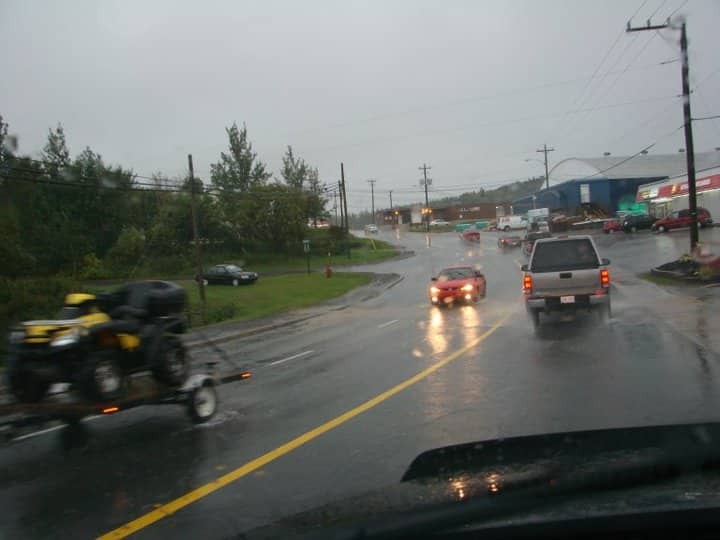 Traffic piling up in Port Blandford. 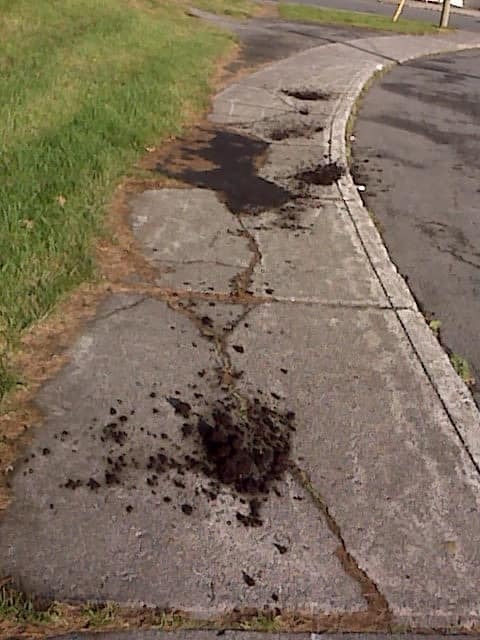 Local road damage. Main Road in community still open. 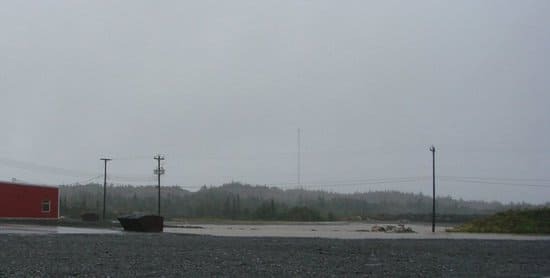 High wind in Cupids, N.L. 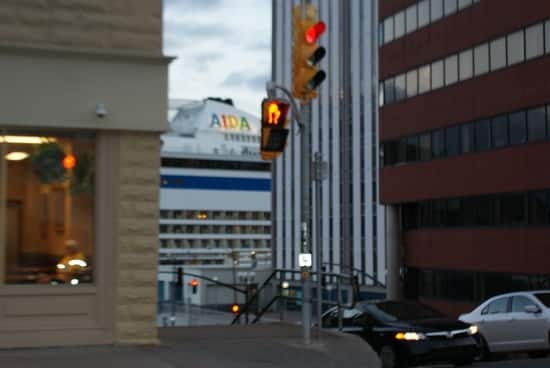 This is to advise that all Provincial Government offices in the St. John's area, including the East and West Blocks, Confederation Building, have closed for the remainder of the day (Tuesday, September 21), as a result of Hurricane Igor. 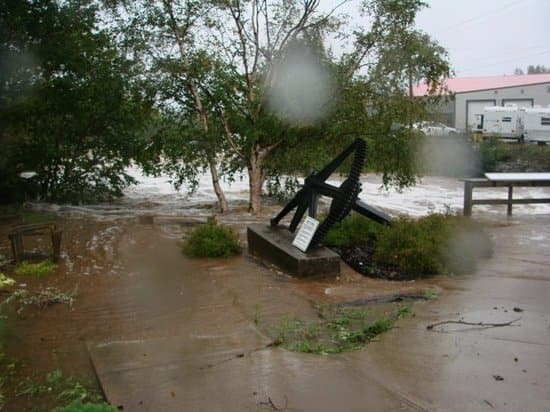 A number of Provincial Historic Sites and Visitor Information Centres around the province are closed for the remainder of the day due to storm conditions. Visitor Information Centres in Whitbourne, Clarenville and Argentia are closed. 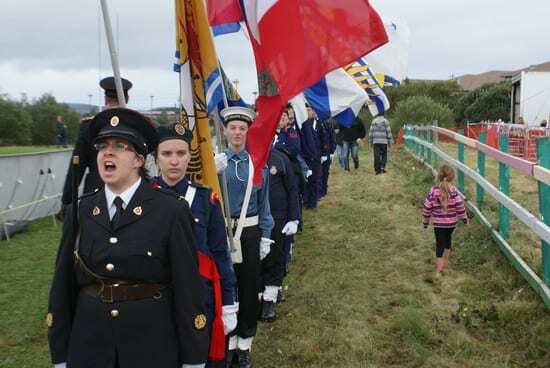 Provincial Historic Sites closed for the day are: the Cape Bonavista Lighthouse and Mockbeggar Plantation in Bonavista; Hiscock House and the Mercantile Premises in Trinity (the Visitor Centre is closed for renovations); the Heart's Content Cable Station; the Beothuk Interpretation Centre in Boyd's Cove, and the Quidi Vidi Battery in St. John's. The offices Newfoundland and Labroador Housing Corp will be closed for the remainder of the day. Gander law courts closed for the remainder of the day. Gander Service Canada Centre is closed for the remainder of the day. Glovertown school complex does NOT have water inside the building, as earlier suspected. Glovertown Lion's Bingo cancelled for tonight. Eastern Health has postponed its Annual General Meeting scheduled for tomorrow (Wednesday, September 22) in Salon B, Holiday Inn. The public will be advised when a new date has been scheduled. All classes and choirs from Take Note Music School is cancelled for the day. Canadian Blood services closing at 2:30. No evening clinics. Bank of Nova Scotia branches, st. John's and area, closing at 2:30. Chef to Go cooking class cancelled for this evening. Ross King Library in Mt. Pearl closed. All A.C. Hunter public libraries closed. The Department of Education's public consultation and meetings today and tomorrow in Labrador City have been postponed. First Vanier beavers and cubs registration cancelled for tonight. 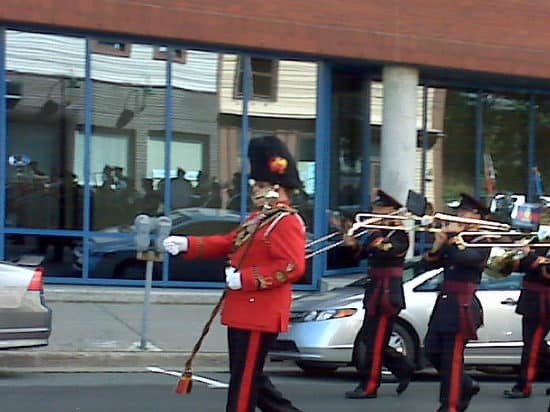 Long and McQuade music store on Kenmount Road closed. ALL CANADA REVENUE AGENCIES OFFICES IN St.Johns and AND MOUNT PEARL ARE CLOSED FOR THE REST OF THE DAY. Eastern Health says all routine appointments in Marystown and the Town of Clarenville and non-emergency services, which would also include blood collection and x-ray services, have been cancelled for today. Service Canada offices in the St. John's Metro area are closed. 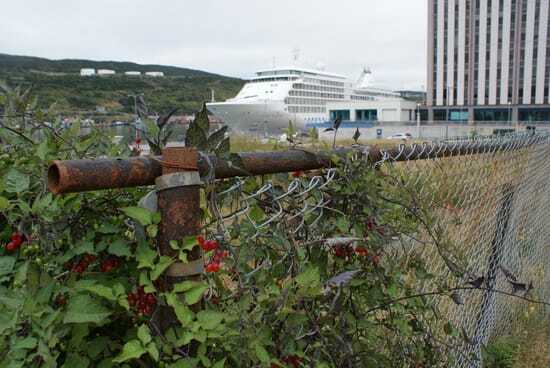 Government Service Centre in Clarenville, in Grand Bank, Marystown are closed, as is the Credit Union Deposit Guarantee Corporation, Marystownn and the Registry of Deeds Office, St. John's. Motor Registration Division Building in Mount Pearl is closed until further notice. All DFO offices in St. John's area closed. Blue Cross on Kenmount Road is closed. 50 Plus Bowling League at Plaza Bowl is cancelled. 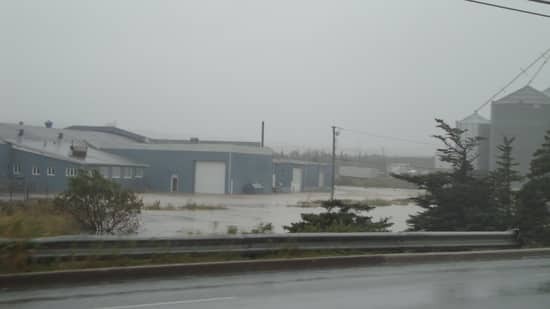 Due to flooding in the basement impacting the building's electrical systems, the Department of Government Services' Motor Registration Division Building in Mount Pearl is closed until further notice. Blue Cross on Kenmount Road closing due to flooding. --Shalloway rehearsal cancelled this evening. -- St. John's choir rehearsal cancelled for tonight. --Lakewood Academy in Glenwood closed for the afternoon, meet the teacher night and the grad meeting are rescheduled for next Tuesday. --Due to weather conditions, the Hepatitis B clinics for nursing and medical students scheduled to take place in the Student Health Clinic in the University Centre on the St. John's campus this afternoon and evening have been cancelled. Cape St. Mary's Ecological Reserve is closed today. 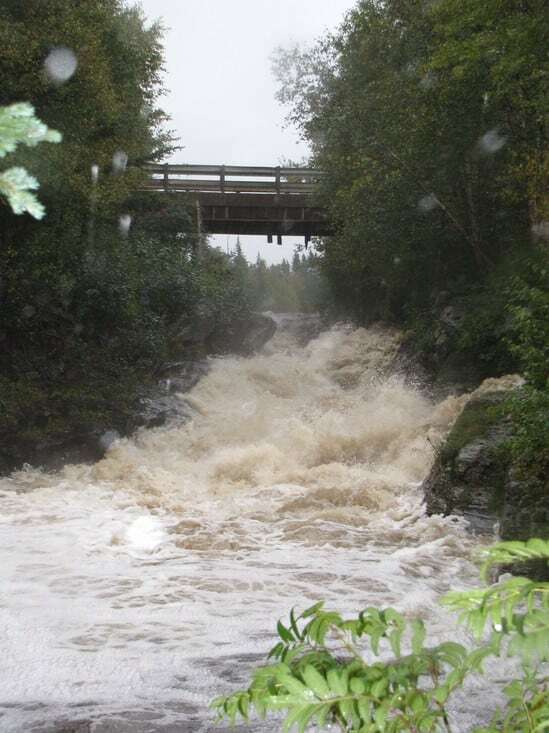 Parks Canada says the road leading to the Town of Terra Nova is closed until further notice. Parks Canada staff is on-site and will assist in emergency situations, however the public is asked to avoid Route 301. The KinderStart orientation session for parents at Beachy Cove Elementary School has been cancelled. It will be rescheduled...when we get to shore. Bowling for special olympics in Mount peark is cancelled tonight. Discover Music school on Topsail Road closed for the day. The Department of Human Resources, Labour and Employment is advising residents that the public consultation session originally scheduled for tonight (Tuesday, September 21) at 7:00 p.m. in Hopedale, will be rescheduled because of the weather. College of the North Atlantic campuses in Bonavista, Clarenville and Burin closed all day. The MUN LAB Band and Orchestra is cancelled for today. (another information/registration session will be at 3:30 on Thursday at the MUN Music Bldg in Room 1033. 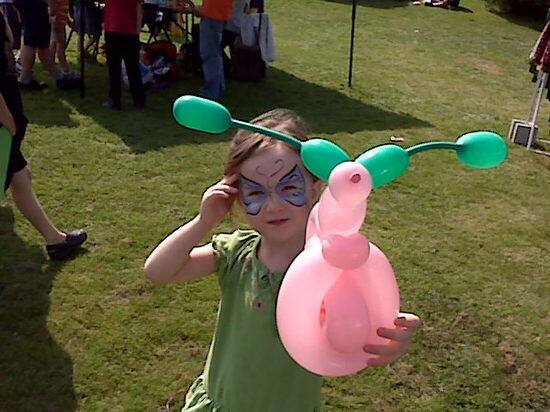 The Childrens Centre on Craigmillar Avenue is closed for the day. The City of St. John's Department of Recreation Play Group Program scheduled for 10:30am today at the Wedgewood Park Recreation Centre will be cancelled due to the poor weather conditions. Parks Canada advises that Cabot Tower on Signal Hill National Historic Site, St. John's - closed all day today and Cape Spear National Historic Site, St. John's - closed all day today. 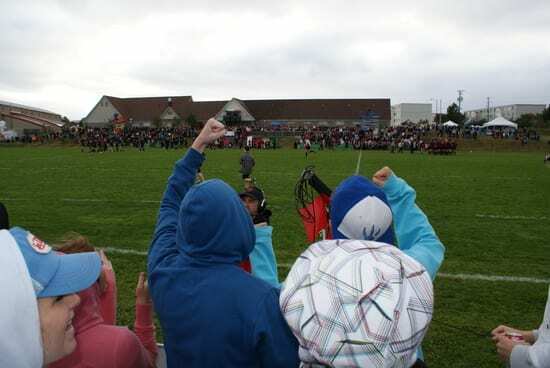 All City of St. John's Outdoor Sport Facilities are closed and will remain closed today and tomorrow. There will be an update on Thursday regarding when the facilities will re-open. For more information please call 311. Arthritis society office closed for the day. 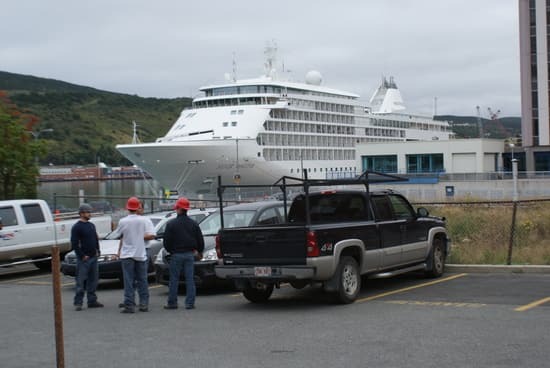 Stroke survivor support group meeting cancelled in St. John's this evening. The Birdhouse on Duckworth St. closed for the day. The Play Group Program scheduled for 10:30 am today at Wedgewood Park Recreation Centre is cancelled. Salmonier Nature Park is closed for the day. No V.O.N Meals on Wheels today. Musical Friends meeting at Bennett Avenue is cancelled today. 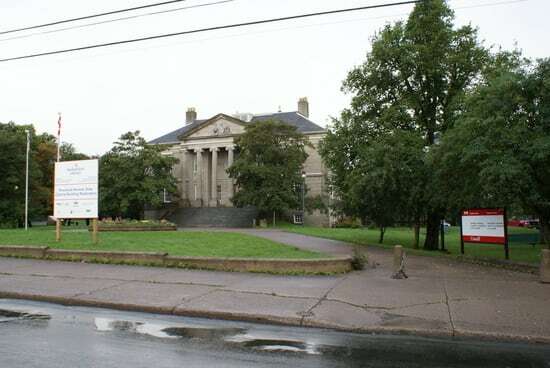 morning with a further announcement by 11:00 a.m.
Little Gym of St. John's, Torbay Road, closed this morning. Evening update at 2. The Gathering Place in St. John's will be closed today. The Leyton Gallery in St. John's is closed today. Memorial University St. John's campus closed as of 1:00, including child care centre and Marine Institute. College of the North Atlantic campuses at Prince Philip Drive, Ridge Road, Seal Cove, Placentia now closed. Bonavista, Carbonear, Clarenville, Burin and Bonavista campuses already closed. All schools in Gander, Glovertown Academy, Pearson Academy in Wesleyville and Centreville Academy are all closed this afternoon. 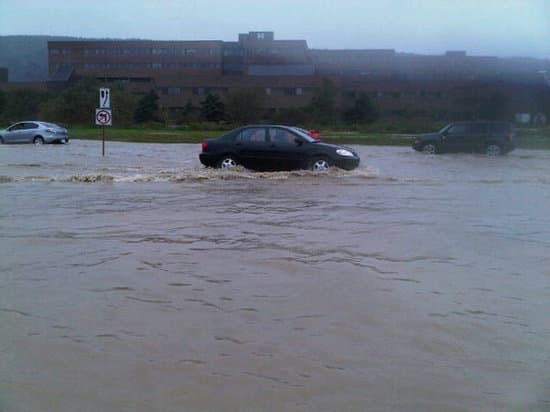 Exploits Valley high school in Grand Falls-Windsor has closed due to flooding in the cafeteria. The Eastern School District advises that all schools under the jurisdiction of the Eastern School District (Burin, Vista, Avalon West and Avalon East regions) will remain closed today. Ecole des Grands Vents and Lakecrest will stay closed today. St. Bonaventure's College will be closed tomorrow September 21st, 2010 for the full day due to the pending weather. The curriculum night for Grades 7-12 scheduled for Tuesday evening is postponed till further notice. St. Peter's school in Upper Island Cove will be closed in the morning with a further announcement at 10:30am. First Baptist Academy in Mount Pearl is closed all day. St. Kevin's High School curriculum night is cancelled. It will be held next week. The Meet and Greet for parents and guardians of O'Donel's students is being postponed tonight, due to weather. seen is a collection of images, videos and observations that are topical, but normally wouldn't fit into any newscast. 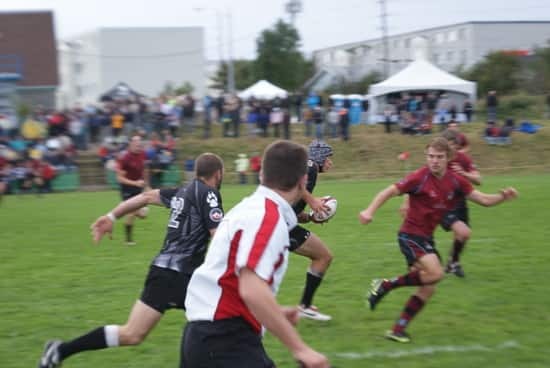 So it's not CBC or St. John's-centric, please submit photos to the form on the side. We're always updating our seen entries, so check the archives for more. 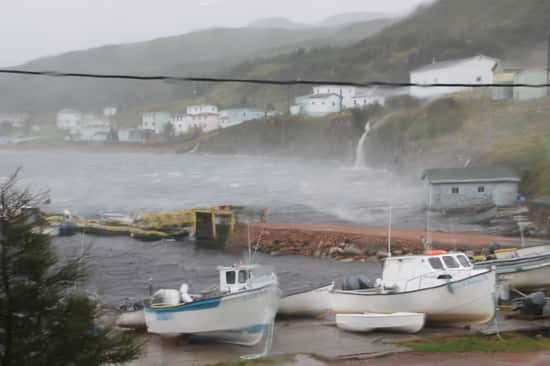 The current path of Hurricane Igor has prompted Environment Canada to issue a tropical storm watch and rainfall warnings for most areas of Newfoundland and Labrador. The Provincial Government, through Fire and Emergency Services - Newfoundland and Labrador (FES-NL), is encouraging all citizens to be prepared for flooding, power outages, and other potential impacts. 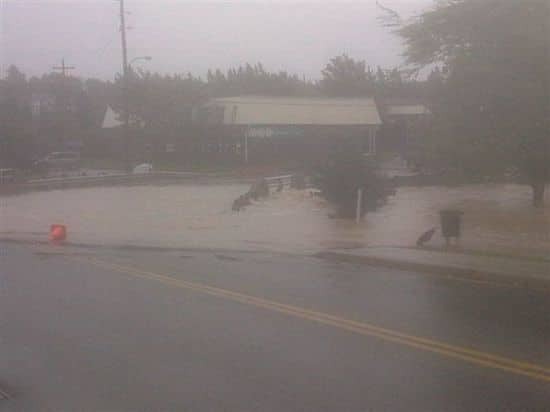 As of this morning, Hurricane Igor was a Category One storm system tracking north-east of Bermuda, heading across the Atlantic Ocean and anticipated to cross the Grand Banks Tuesday with heavy rains and high winds. 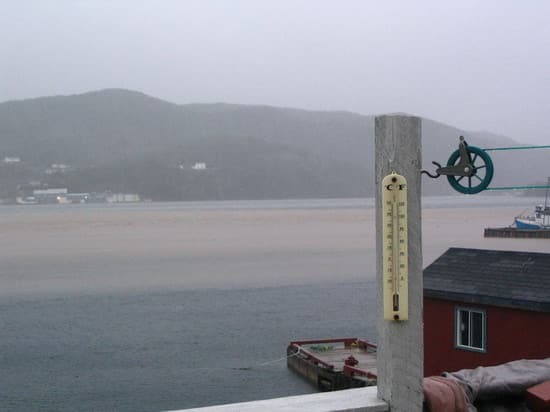 The hurricane is expected to change to a tropical storm soon after it reaches the Grand Banks, and it is anticipated most areas could see precipitation amounts as high as 100 to 150 mm in areas including the Avalon, Bonavista, and Burin Peninsulas and Central Newfoundland. Rain is expected to begin this evening and continue throughout the morning on Tuesday, creating hydroplaning conditions for much of the province's roadways. Caution is advised for those having to travel throughout the next 24 hours. The amount of rain forecast means residents and communities must be diligent in emergency preparations to ensure minimal impact. Residents and municipal officials should assess their individual situations to determine the steps they can take to ensure their safety and security during this weather event and continue to closely monitor the forecast. 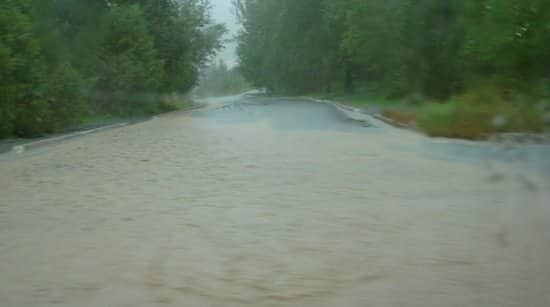 Municipalities should also ensure that all storm sewers, culverts, bridges, and drains are free from debris and that emergency personnel are available should the need arise. Should you notice downed power lines in your area, do not touch or attempt to move, but instead advise your utility provider immediately. If a household includes someone with a medical condition, mobility issues, or other special needs, plan for their specific requirements. 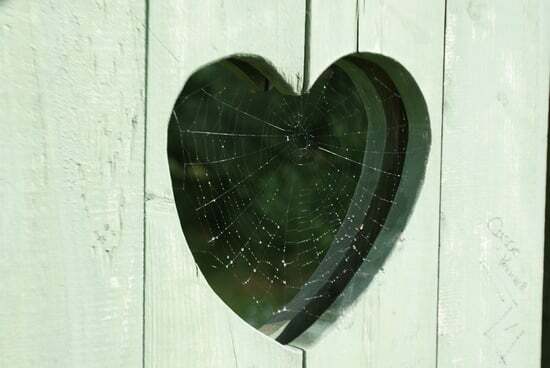 Residents are also reminded to ensure pets that are normally kept outdoors are safe from wind and rain and those who are aware of neighbours living alone are asked to check to ensure they are safe. If an emergency requiring assistance occurs, residents are reminded to contact their local fire department and/or police for assistance. If flooding occurs, residents should contact their municipality. Should communities become unable to cope with local emergencies, they may contact FES-NL for assistance. Citizens are asked to exercise extreme caution as this weather system approaches and throughout the course of this event. 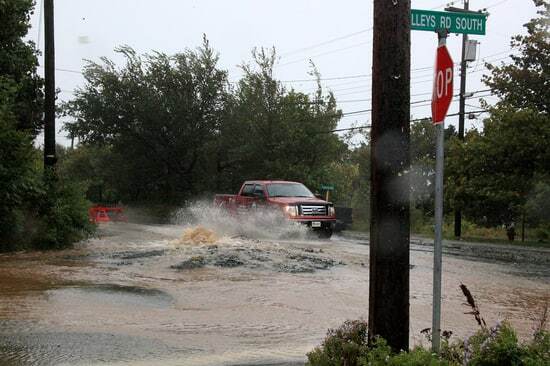 Residents are advised to expect heavy rains accompanied by high winds accompanied by rain overnight tonight, continuing on till Tuesday afternoon.Those residents who rely on sump pumps are advised to check them for proper operation. In case of basement flooding, do not enter a flooded basement for fear of an electric shock. Residents are advised to secure or remove items from yards. Residents should also prepare for the possibility of power outages, and have flashlights and provisions available. Continue reading Public Service Announcement Sept. 20/2010. 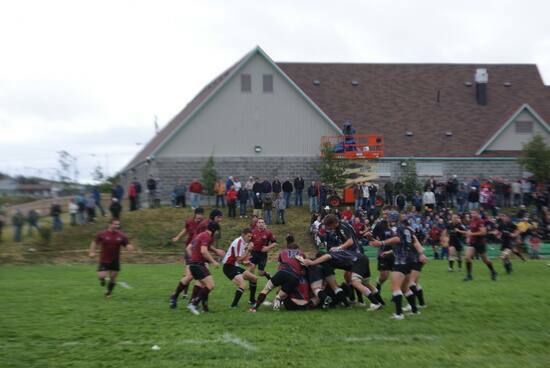 Images from the Swilers Complex in St. John's on Saturday when the Rock beat the Prairie Wolf Pack 19-8. The St. John's Fire Department attending the scene of a possible fire on Sunday night. Fortunately it was a false alarm. 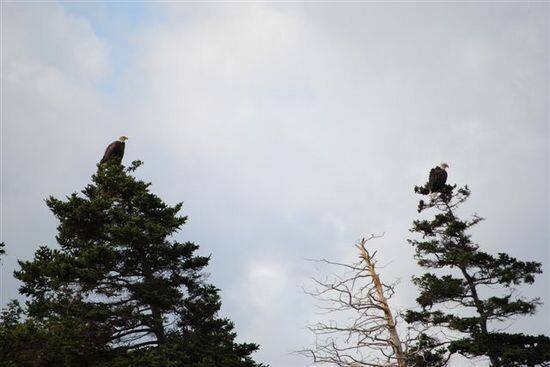 These two beauties were spotted spying down on the people at Topsail Beach Friday at about noon. 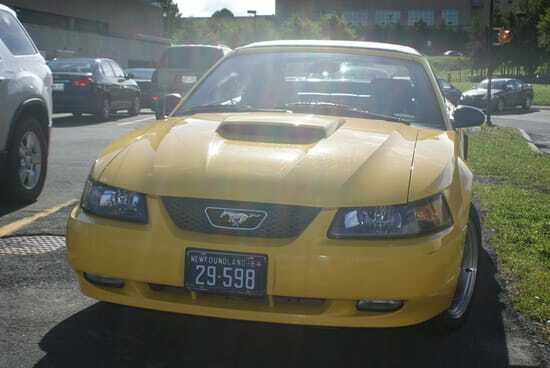 seen thanks Rod Etheridge. "My sign is bigger than your sign" at the Colonial Building in St.John's. 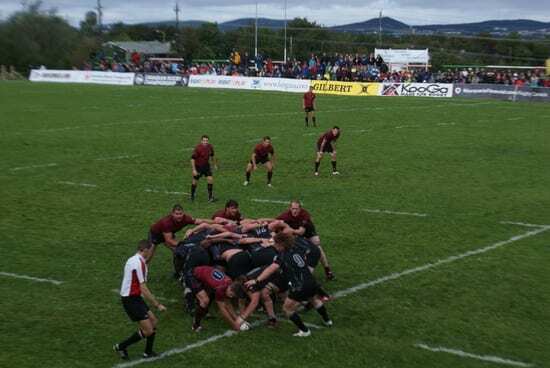 This one was taken by John Mathieu, a regular contributor to our Your Photos section. 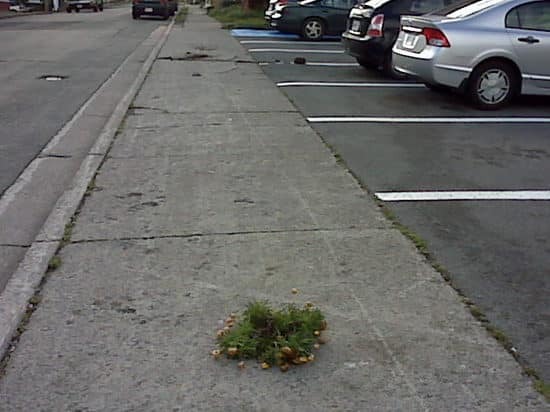 Allendale Road in St. John's is usually maggoty with cars at the time some of the seen collective walk by. 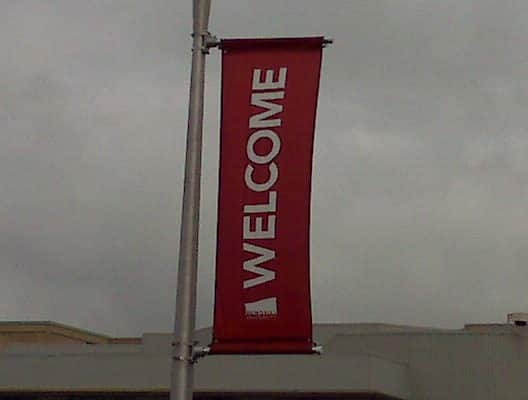 Things were a bit quieter today, perhaps because of the construction by the Re/Max Centre. Beauty ... seen at a St. John's flower shop. Those sunflowers are real. 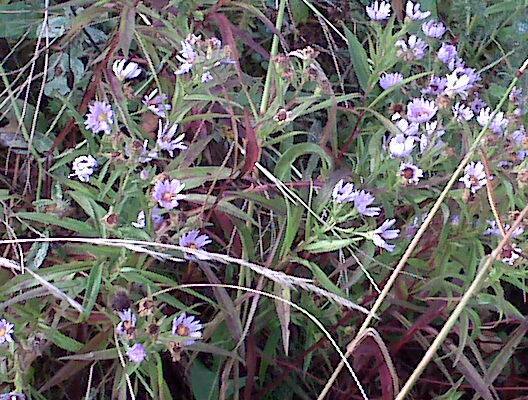 Beauty in wildlife ... seen: wild Asters in a St. John's park. 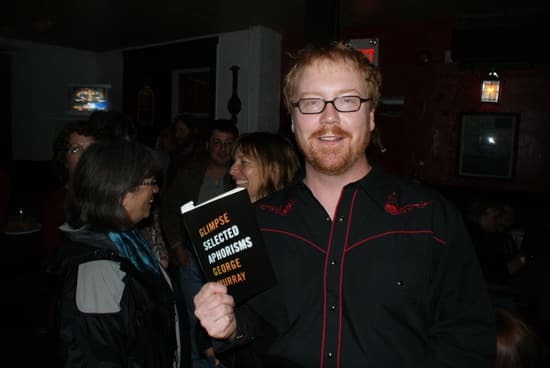 seen was out on the weekend and came across the always impressive literati of St. John's celebrating the launch of local poet George Murray's latest - Glimpse: Selected Aphorisms. 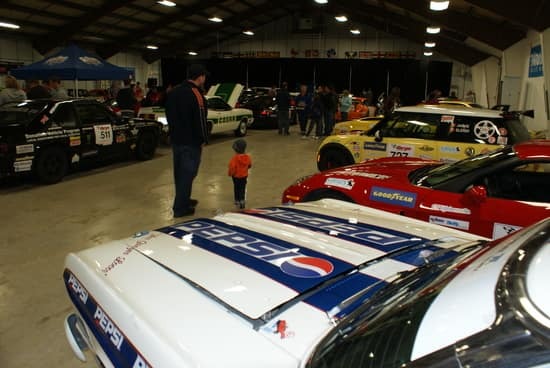 The Targa Newfoundland race is full on this morning, but over the weekend the cars were on display at the Re/Max Centre in St. John's. Some St. John's youngsters are looking more magical these days. 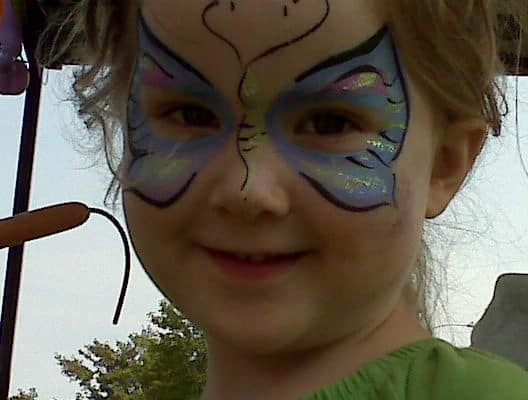 There re some epic facepainters at the Farmers Market on Saturday turning your little one into a dragon or a monster or covering your face with flowers or in the case of this young lady ... a butterfly. When the rain comes down, the ducks take advantage. Here they are in their new water feature unintentionally created by Friday's rain in front of the CBC. 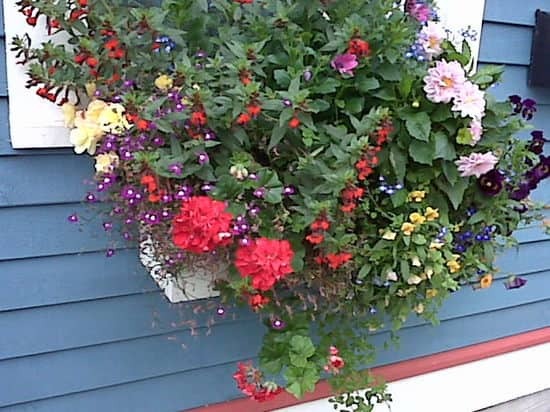 And so seen celebrates summer with this image of a beautiful flower box somewhere in downtown St. John's. Here is the Silver Sea. 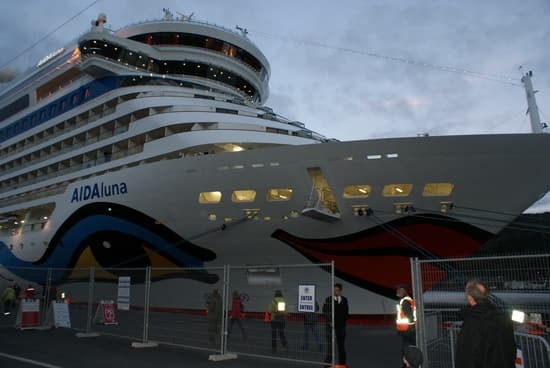 It probably passed the AidaLuna in the night. Hot on the heels of the Spirit of Oceanus, we have the AidaLuna. 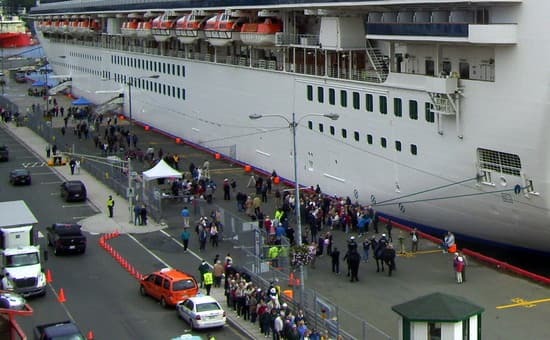 They must have them lined up outside the Narrows. 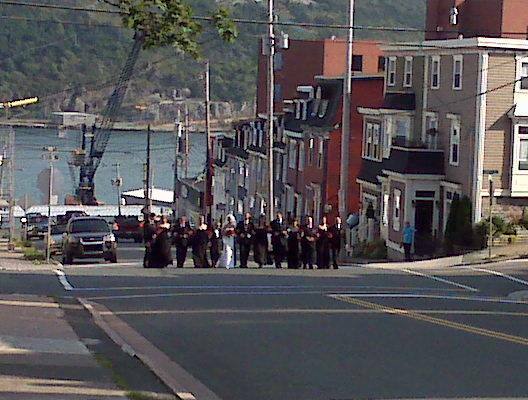 seen has posted pictures before of this new trend in the city's wedding photography where bridal parties take to the street, here is another one from the weekend. One of the biggest indicators that school is back is increased traffic on some St. John's streets. This is Elizabeth Avenue at 9 a.m. today. A bit of minor vandalism in downtown St. John's this morning. Someone doesn't like flowers or doesn't want to go back to school. And it's time for the start up of a new session at Memorial University. Labour Day means different things to different people, but to many on the weekend it meant berry picking. 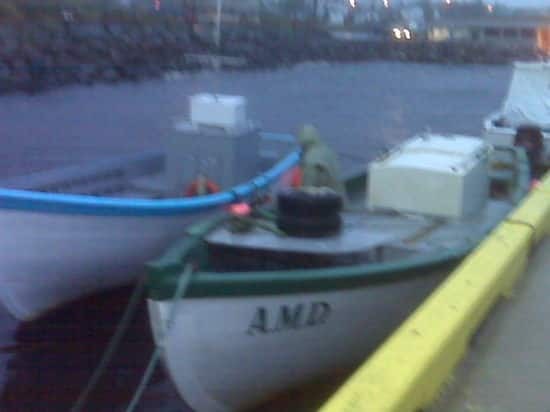 These pictures were taken near Quidi Vidi in St. John's. 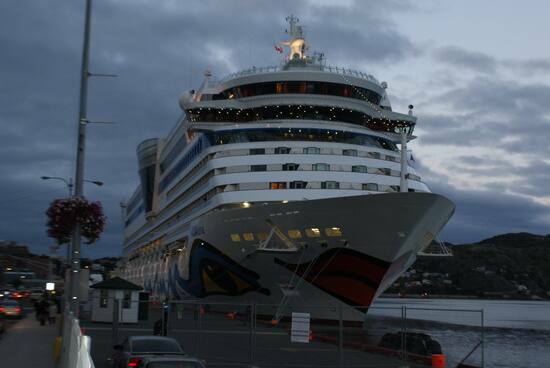 seen heard the familiar horn signalling that a cruise ship is about to leave St. John's harbour about 10 p.m. last night. So it was time to run out i n the street and record the ship as it passed down at the bottom of Cochrane Street. 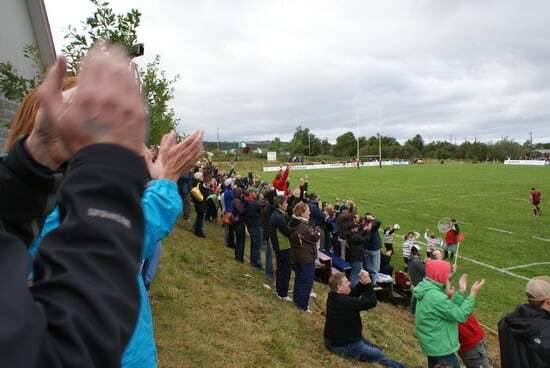 This photo is by Neil Simmons from Labrador West - one of our favourite photographers. ... for an interview with On the Go's Ted Blades. It's the Gypsy Mermaid a.k.a. 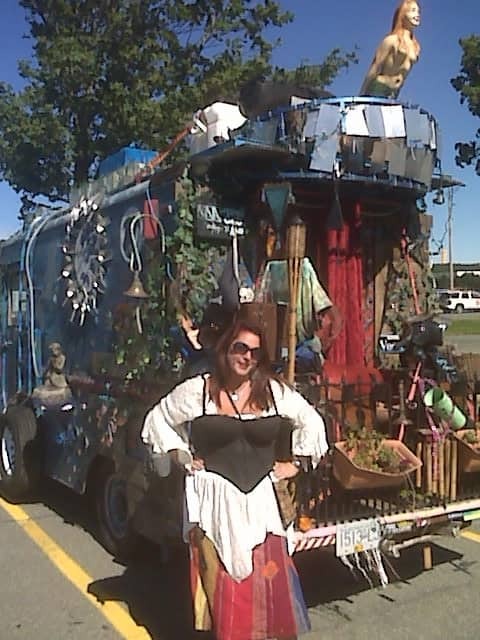 Michelle Kaiser whose unique truck was featured on seen yesterday. The interview will be on On the Go this afternoon.